It’s that time of the year when the festive aura is in the air. The buildings and trees are lit up in colorful lights and all the shops and stores are packed with customers in preparation for the holidays and to welcome the New Year. This year, Kerala went through one of the biggest disasters the State has ever seen. People of Kerala became role models to the people around the world when they united and helped each other hand in hand in the time of crisis. Even at a time when trade and businesses were at its lowest point, small, medium and large-scale enterprises gave generously of what they had to help the needy without any hesitation. If we analyze the effects of the disaster on the economy in the larger picture, the floods affected the sales during Onam this year resulting in huge losses to the State’s exchequer. Tourism, agriculture, construction and every other vertical in the economy was affected by this natural calamity. A major drop in revenue for the tourism sector this year is evident as an aftermath of the floods. We understand that there has been a spate of cancellations from tourists, both domestic and international, which has been a huge blow to this sector. Let us hope that the picture will change in the year to come. We hope that the increased sales during this festive season will be a booster for the economy. The frequent hartals in the State have become a menace, creating untold hardship to business, commerce and the common man. There have been 97 hartals, big and small, across Kerala during the last one year. It is time for us to reminisce and realise the damage that these outdated methods of protest are doing to the State’s economy. The Cochin Chamber has always been advocating a complete ban on hartals as a means of protest. We are committed to this and hope that this will become a reality sooner than later. It is heartening to see that various organisations and groups have now woken up to this issue and have put out statements to the effect that they will not support hartals in the future. This is a very positive step and we welcome it wholeheartedly. The Chamber has been consistently organizing programmes of importance to business and industry. Over the last one month, we have had a variety of programmes which I will outline briefly below. 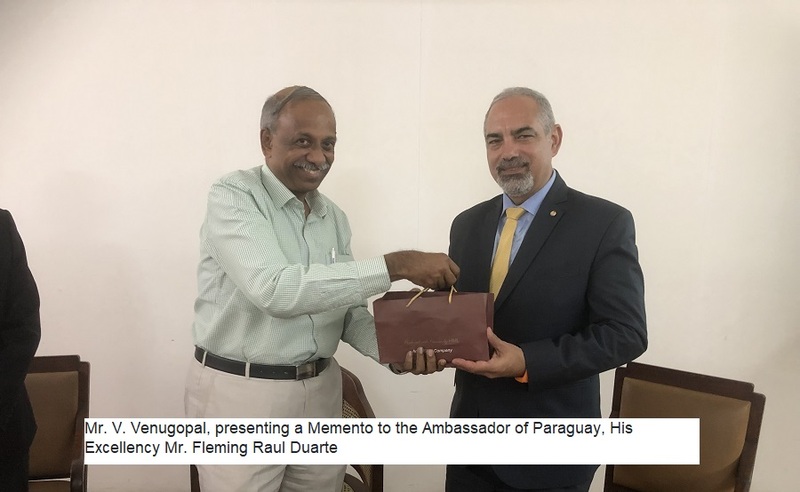 On the 26th of November, the Ambassador of Paraguay, His Excellency Mr. Fleming Raul Duarte visited the Chamber to meet the business community here and to promote and explore business opportunities between the two countries. 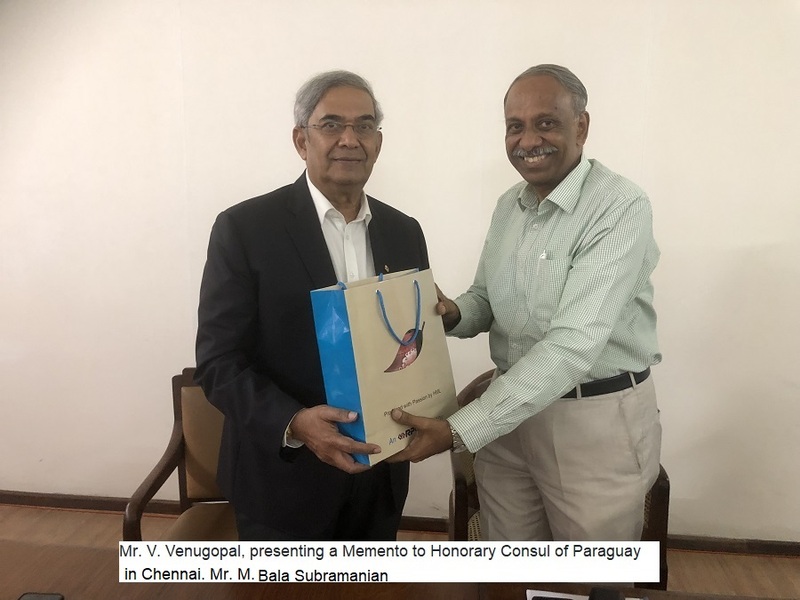 The Honorary Consul of Paraguay in Chennai, Mr. M. Balasubramanian was also present on the occasion. I had the privilege to host them on behalf of the Chamber to strengthen the ties between us. Details regarding the session can be viewed in the ‘recent events’ section of the Newsletter. The Insolvency and Bankruptcy Code 2016 is a subject that is not very familiar to a lot of people. 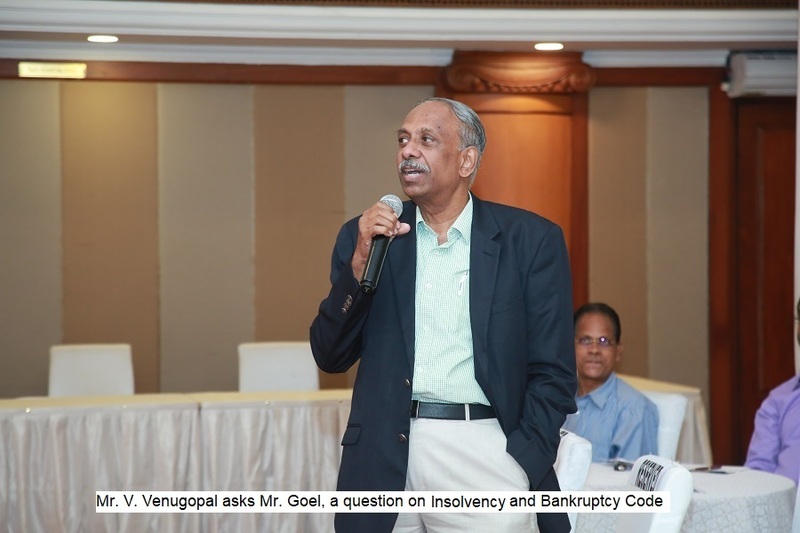 As a means of promoting the understanding of this new Law, the Chamber organized a ‘Talk on the Insolvency and Bankruptcy Code – 2016’ on the 30th of November. 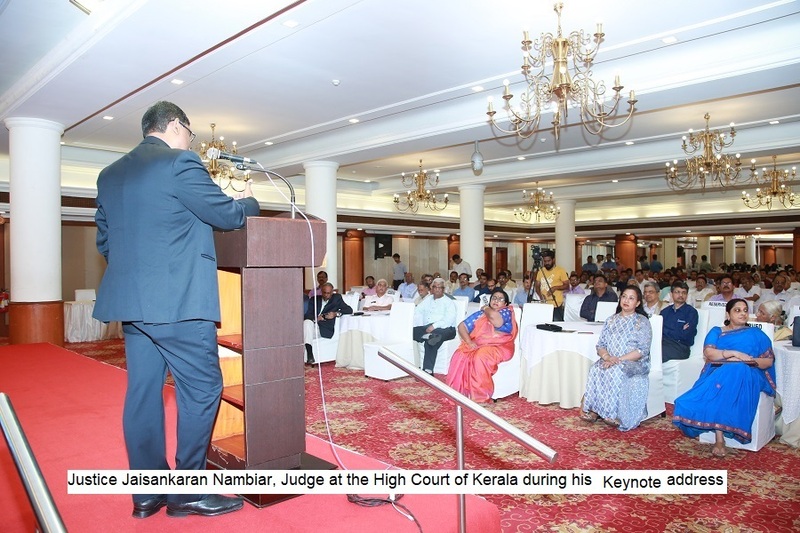 Justice Jaisankaran Nambiar of the High Court of Kerala was the Guest of Honour and he delivered the Keynote Address. 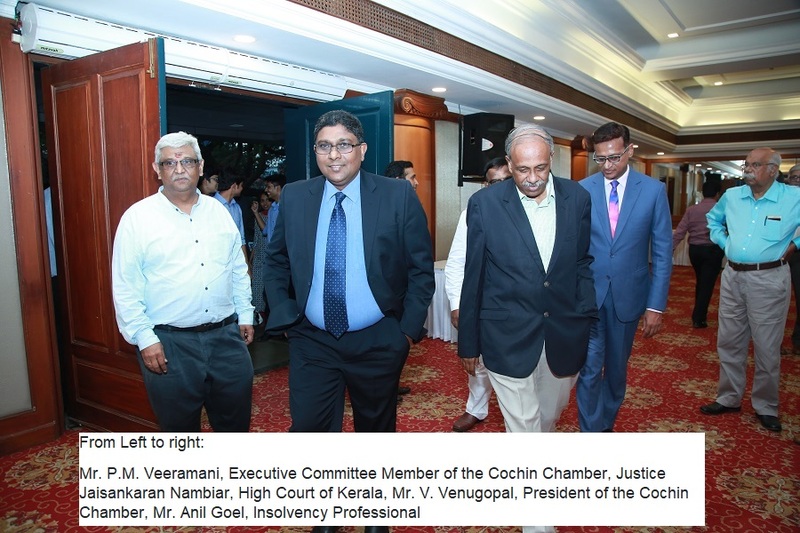 Mr. Anil Goel, an Insolvency Professional from New Delhi was the Speaker on the occasion. 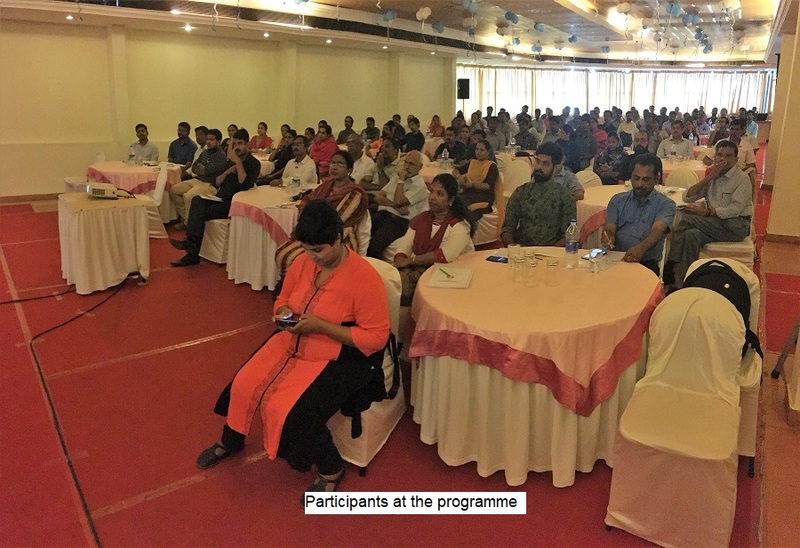 More than 150 participants attended the session and I’m glad to report that this programme was one for the books. 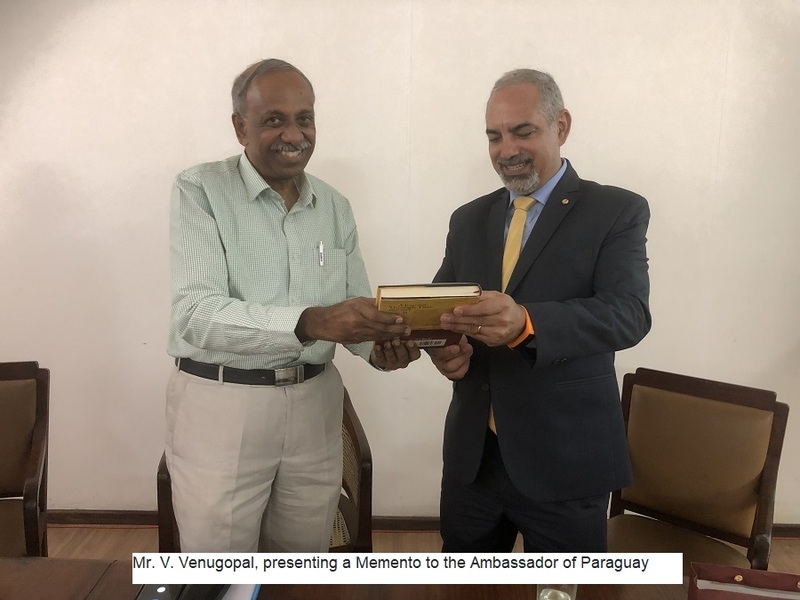 The Port of Antwerp Authority in India has been a long-term associate of the Cochin Chamber. The Chamber has in the past, organized several programmes with the Port of Antwerp Authority and has a very strong relationship with them. 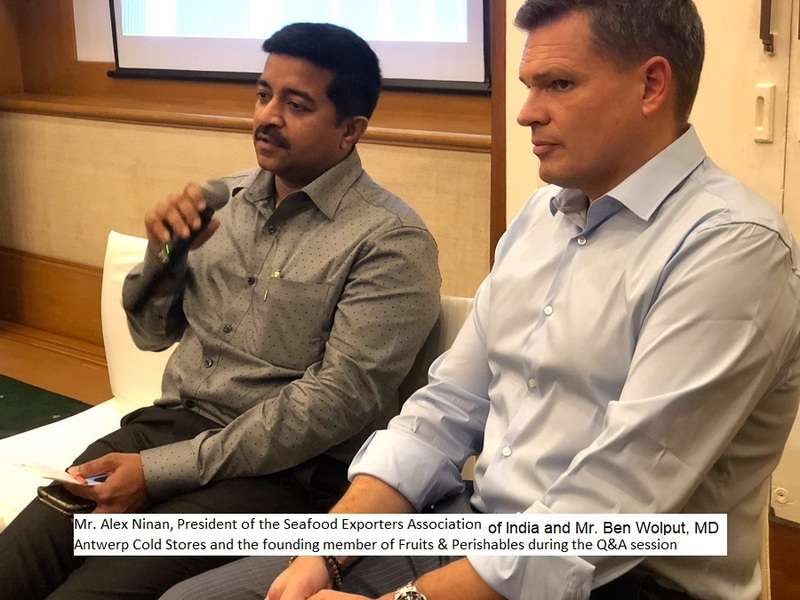 Earlier this month, we had the opportunity to organize another programme along with the Port of Antwerp Authority to discuss the issues faced by the Seafood Exporters in their Supply Chain system. The Port of Antwerp also acts as a Supply Chain Management solution maker. Ms. Malini Dutt, India Representative of the Port of Antwerp Authority was present on the occasion. Mr. Ben Van Wolput the Managing Director of Antwerp Cold Stores took the participants through a presentation and explained the different services that the Port provides. It has been three years since Chamber’s CEO FORUM Breakfast Meetings was commenced. 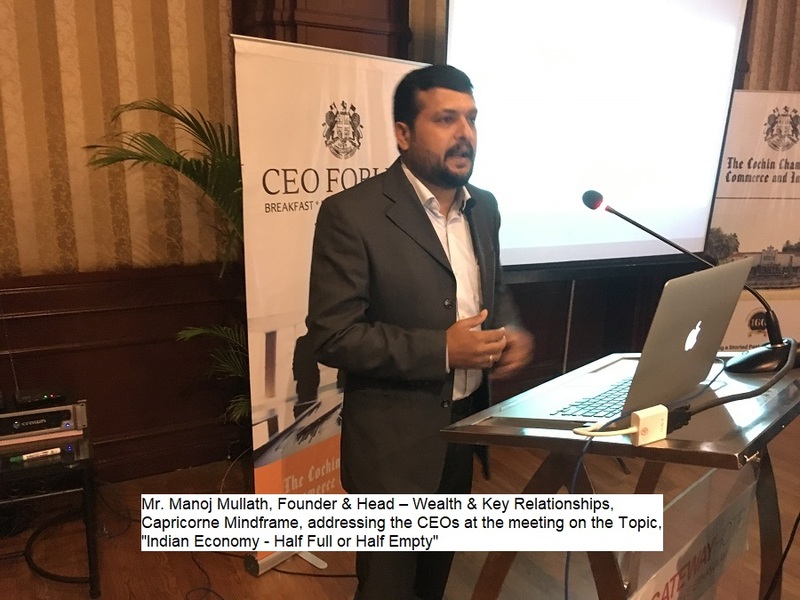 The last session of the 2018 edition of the FORUM was on the 7th of December and was a session on the Indian Economy. 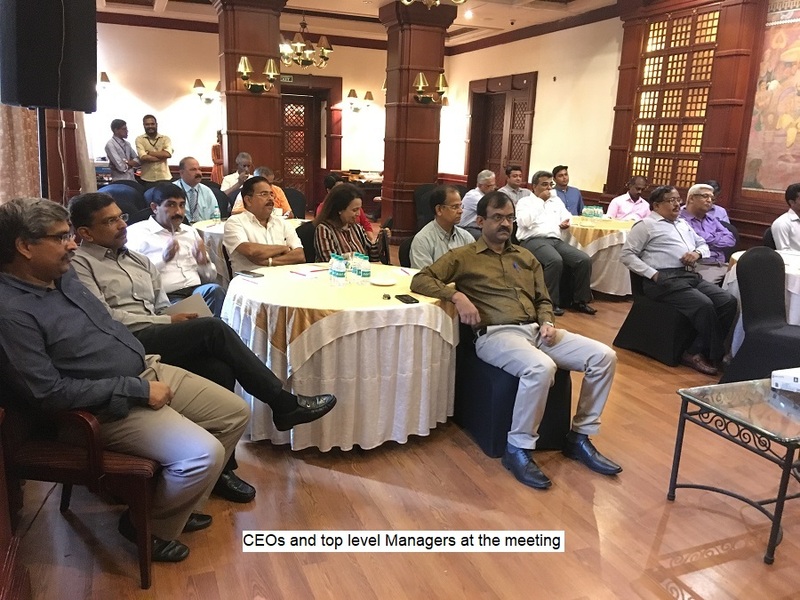 The CEO FORUM has been appreciated from across the industry as one of the more exclusive Networking meetings that any association in the trade and industry organizes. 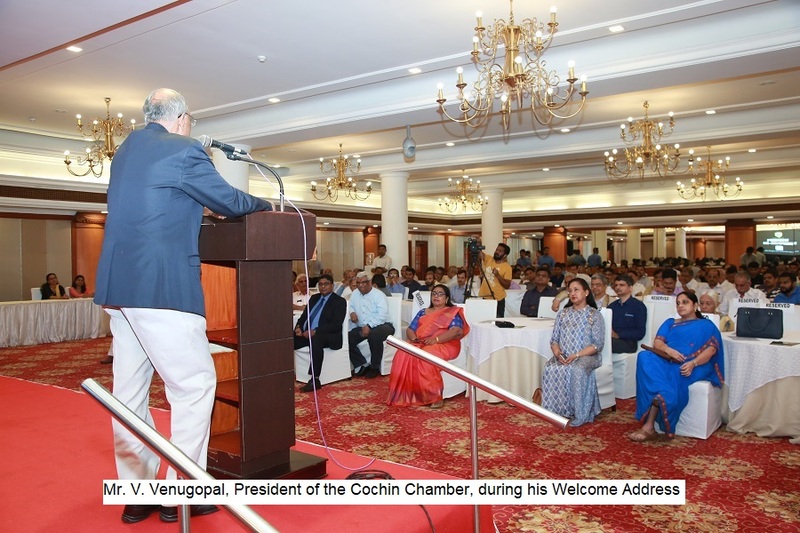 Through the CEO FORUM, the Cochin Chamber provides CEOs, top level managers, CFOs and Managing Directors of ongoing and upcoming enterprises to network, interact, learn and build their business connections. 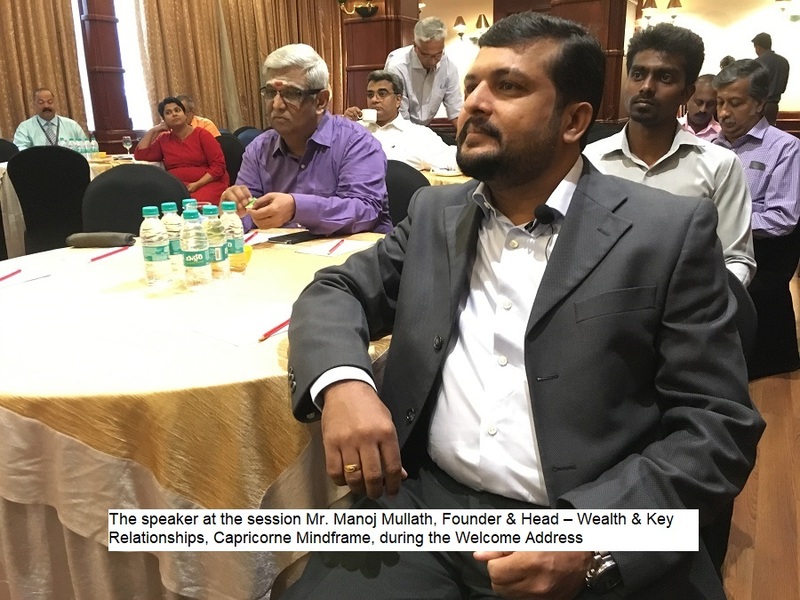 The December CEO FORUM Breakfast Meeting was a very interesting talk on the Indian Economy by Mr. Manoj Mullath, Founder & Head – Wealth & Key Relationships, Capricorne Mindframe, Chennai. 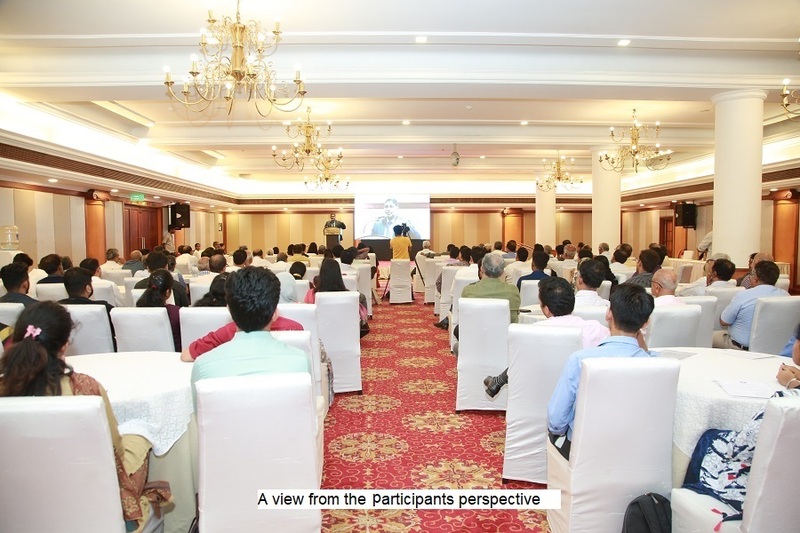 The session covered a variety of aspects of the Indian Economy, with an overview of the history of the Indian Economy. In this connection, I would like to inform you all that the registrations for the CEO FORUM Breakfast Meetings – 2019 are now open, and those of you who are top level managers and CEOs can contact the Chamber Secretariat to register and be part of this exclusive group. Price Waterhouse Coopers (PwC) will be our Knowledge Partner for the coming year too. It is a privilege for us to collaborate with PwC, India and to have them as our Knowledge Partner. The date for filing the GST annual returns has been extended to 31st of March 2019. 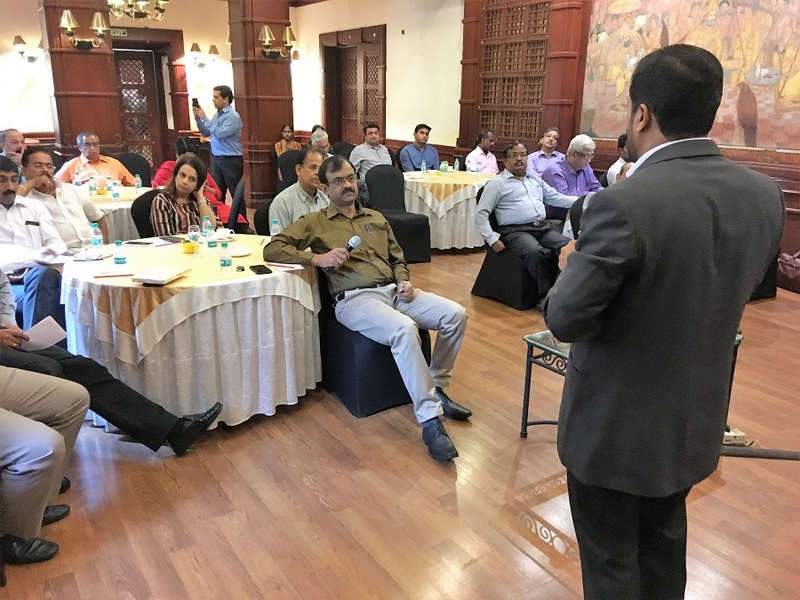 The Chamber, knowing that there was a need for the dissemination of information on the Annual filing process, organized a half day Workshop on GST Audits and Annual Returns, on the 8th of December, 2018. 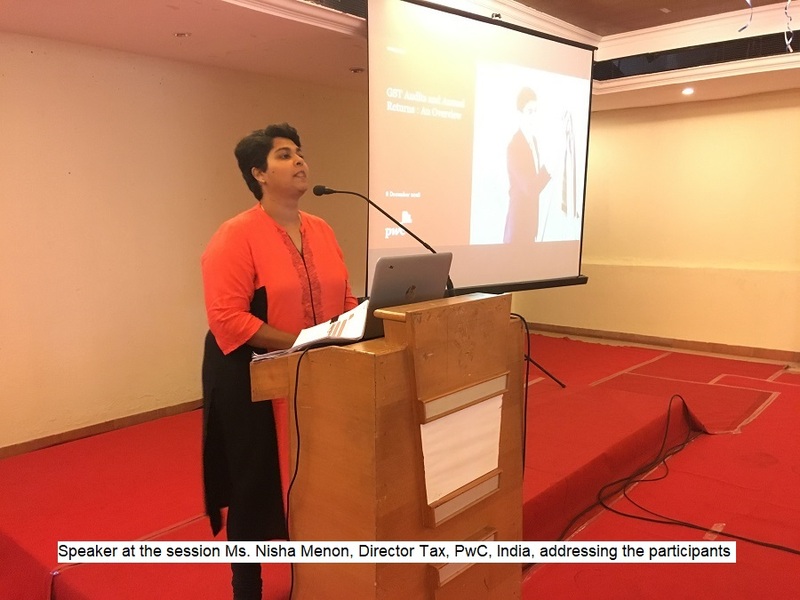 Ms. Nisha Menon, Director – Tax, PwC India was the Speaker at the Session. 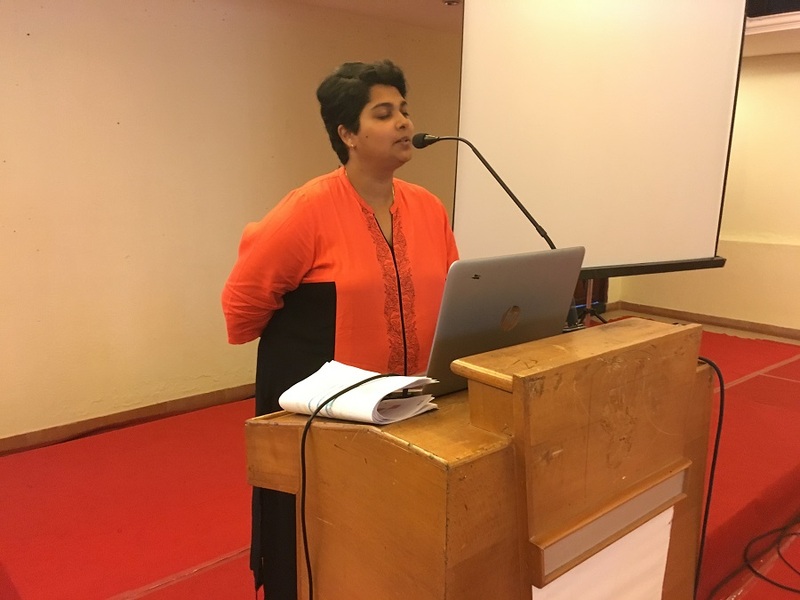 Ms. Menon gave the participants an overview about the subject and towards the end of the session, clarified doubts and queries of the participants during Q&A. More details on these programmes can be found in the “Recent Events” section of the Newsletter. 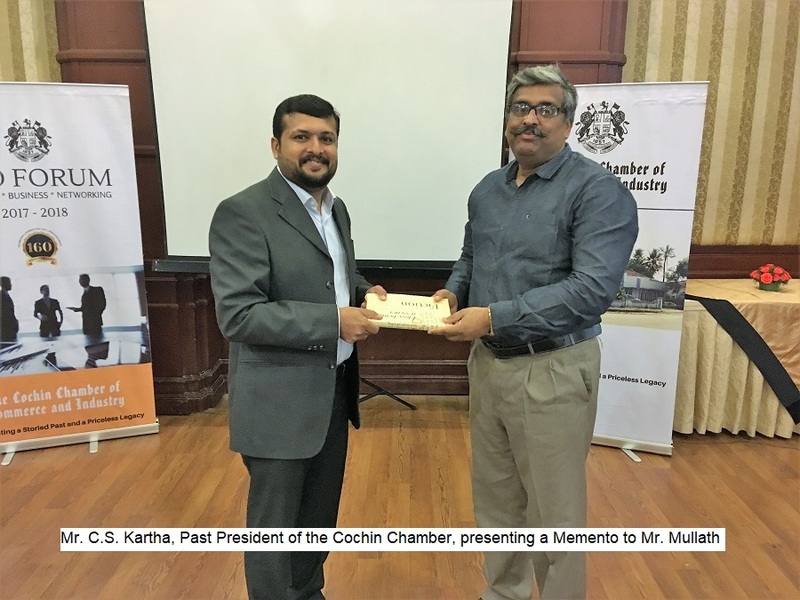 The Cochin Chamber has big plans for 2019. We will be kicking off the New Year with the first CEO FORUM Breakfast meeting of the 2019 edition on the 4th of January. We have Ms. Lakshmi Menon, Founder – Pure Living – Cochin, who will speak on the topic Magic of Innovation – Powerful Impact on Society.” She is the spirit behind the Ammommathiri/Wicksdom, initiative project, designed to provide livelihood for the underprivileged elderly through crowdsourcing. She is also the co-creator of the now famous Chekutty Dolls which turned out to be one of the most innovative and creative initiatives started to help the Chendamangalam Handloom Weavers, post the recent floods in the State. This will be an inspirational and learning session for all who attend, and I strongly urge all the CEOs and Managers to participate in this session. Speakers for the following months have also been finalized. The details regarding the same will be sent to you in due course. We are also planning to commence a quarterly evening lecture series where prominent personalities will be invited as Guest Speakers. Like the CEO FORUM meetings, this will also be a “one of a kind event,” and is scheduled to start in January, 2019. The details for this new initiative are being worked out. The Union Budget 2019-2020 is scheduled to be presented to Parliament on the 1st of February 2019. 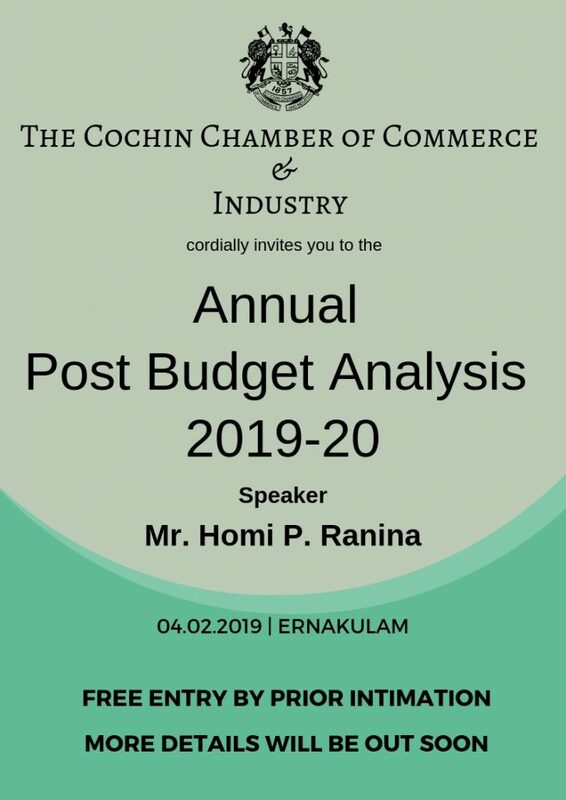 As in the past, the Chamber will be organizing the Annual Post Budget analysis Lecture this year as well, on the 4th of February 2019. Mr. H.P. Ranina will once again be the Speaker on this occasion. The intimation in this regard, will be sent to you all shortly. 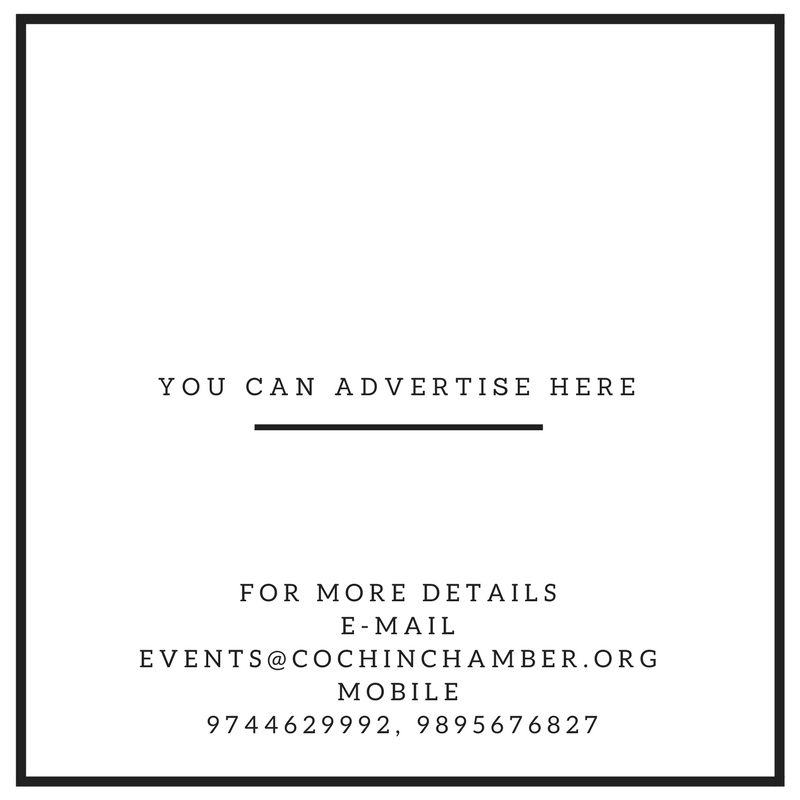 The Cochin Chamber has always been passionate about promoting the new generation of managers. We have supported the Skill Development initiatives, and catered to different needs of the student community here in Kerala for a very long time. Today the employability prospects of eligible youngsters, has become a matter of serious discussion. 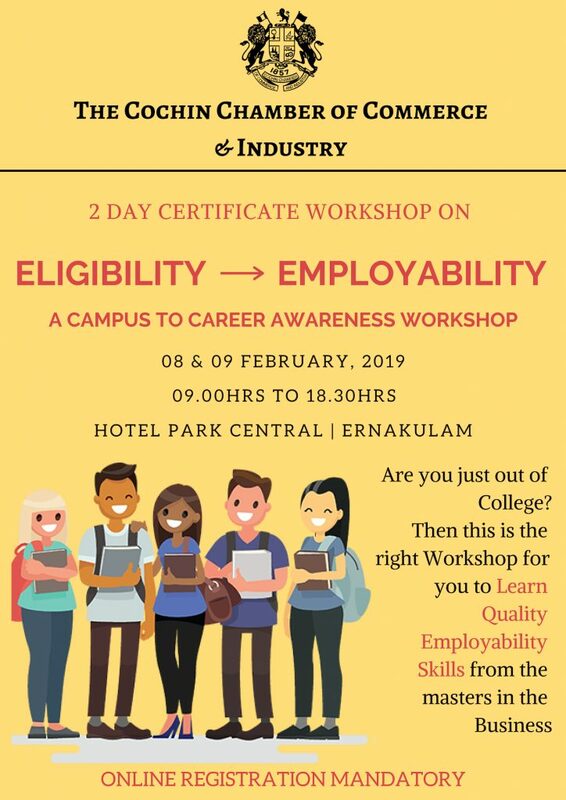 To address the perceived gap between, eligibility and employability, the Chamber proposes to do a 2-day Workshop on the subject in February 2019. We hope that this will help students from Business Schools, Engineering Colleges and Under Graduate Colleges to develop/polish their employability skills and to understand the realities of the real world when they go out job hunting. Preliminary details about this programme are given in the ‘Forthcoming Events’ section of the Newsletter. We seem to be doing so many things at the same time and I must say that I am enjoying being a part of it. 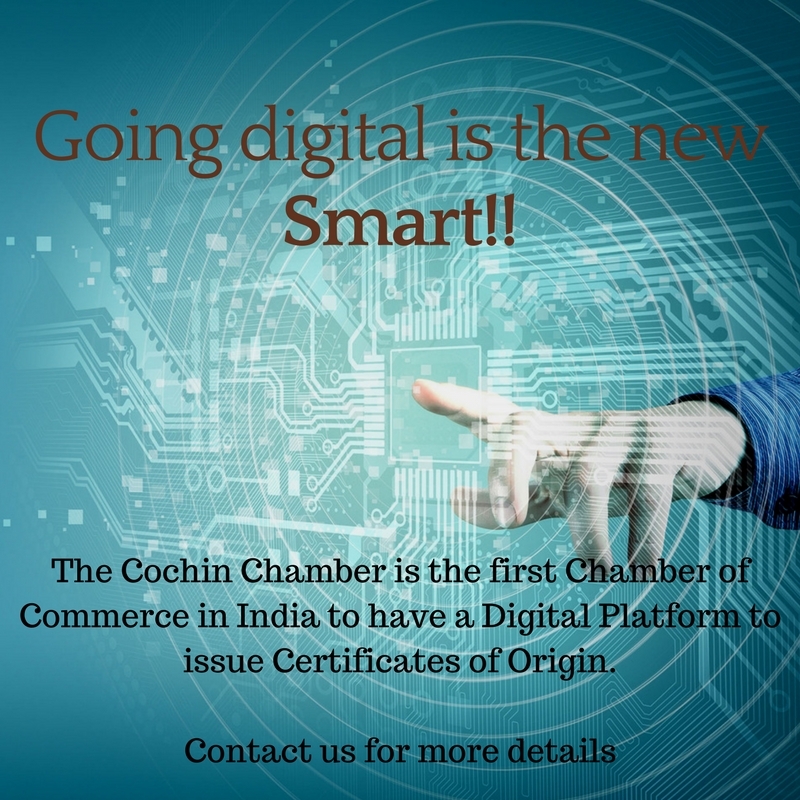 The Cochin Chamber has always remained the premier Chamber of Commerce in the State and we look forward to your support in keeping the Chamber’s flag flying high in the years to come. Wishing you all a Merry Christmas and a Prosperous New Year! 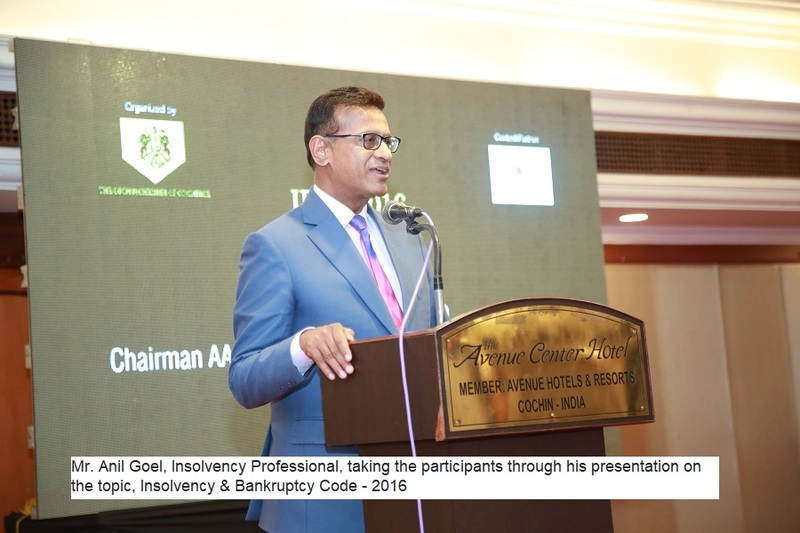 The Chamber organised a seminar on the Insolvency and Bankruptcy Code – 2016, to spread awareness on its implication and to improve the current business environment. 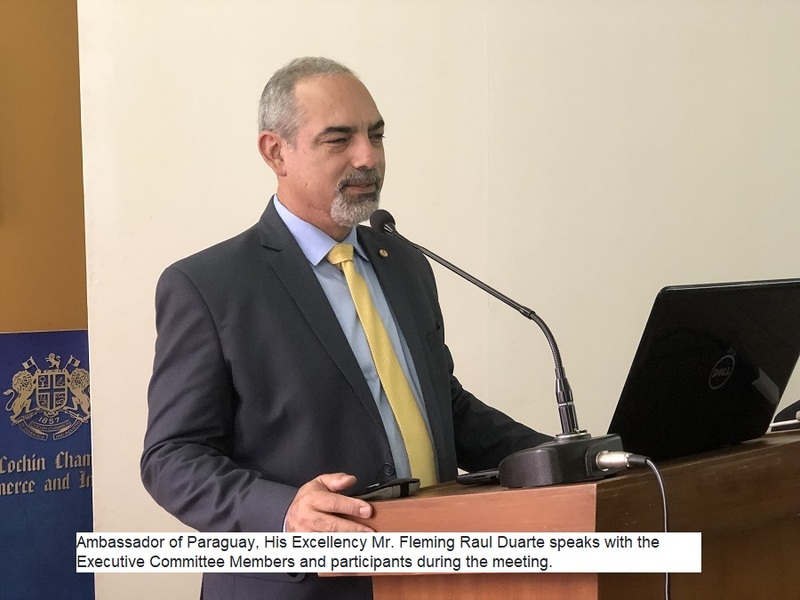 The talk was arranged to coincide with the second anniversary of the implementation of the IBC. 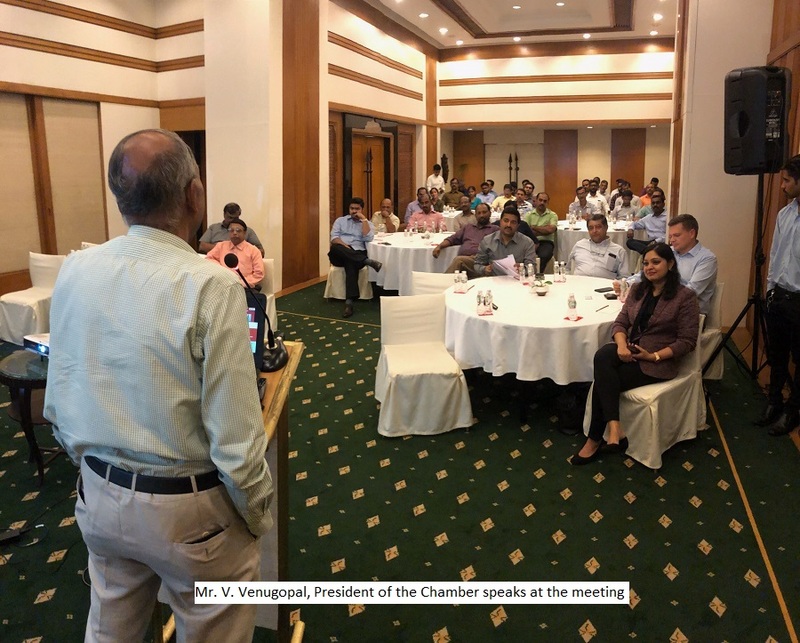 The Port of Antwerp Authority in association with the Cochin Chamber of Commerce & Industry, organized a High-tea Event on Monday the 3rd of December, 2018 at Hotel Trident, Willingdon Island between 16.30hrs and 18.30hrs. 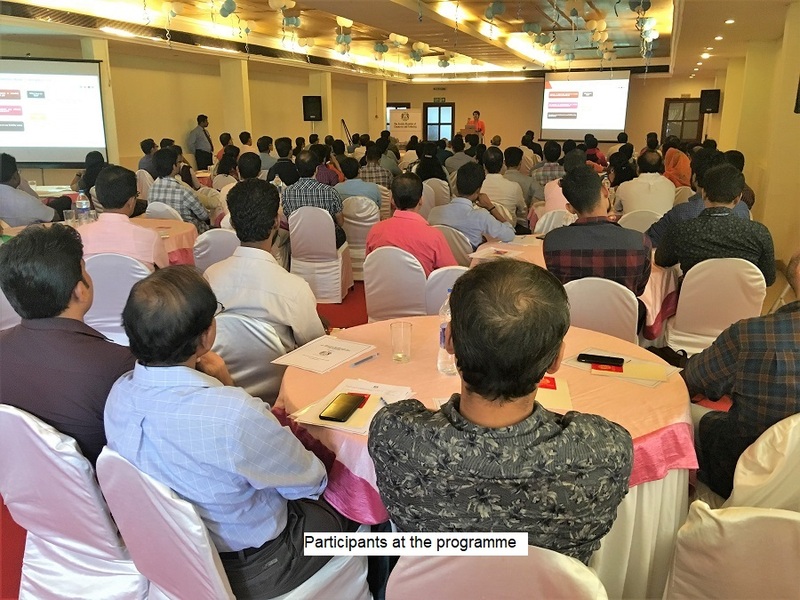 The programme was organized to discuss issues relating to the supply chain of Sea Food Exports and to showcase the Port of Antwerp as an ideal solution to the supply chain management issues faced by the Sea Food Exporters in Kerala. 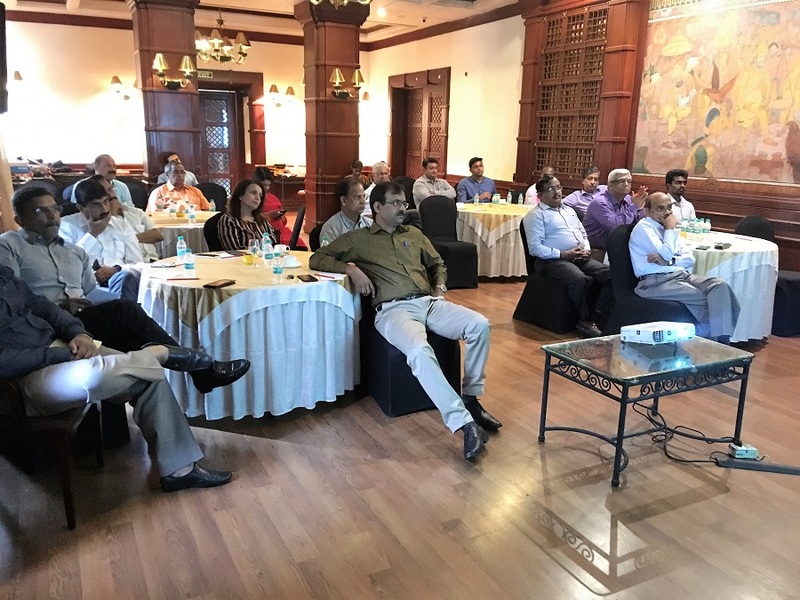 The event was attended by representatives from various Cochin based companies that export and import seafood. The event started at 5 pm with introductory remarks by Ms. Malini Dutt representing the Port of Antwerp Authority in India. She recalled that the Indian Branch Office of the Port of Antwerp was set up in the year 2006, the first of its kind. 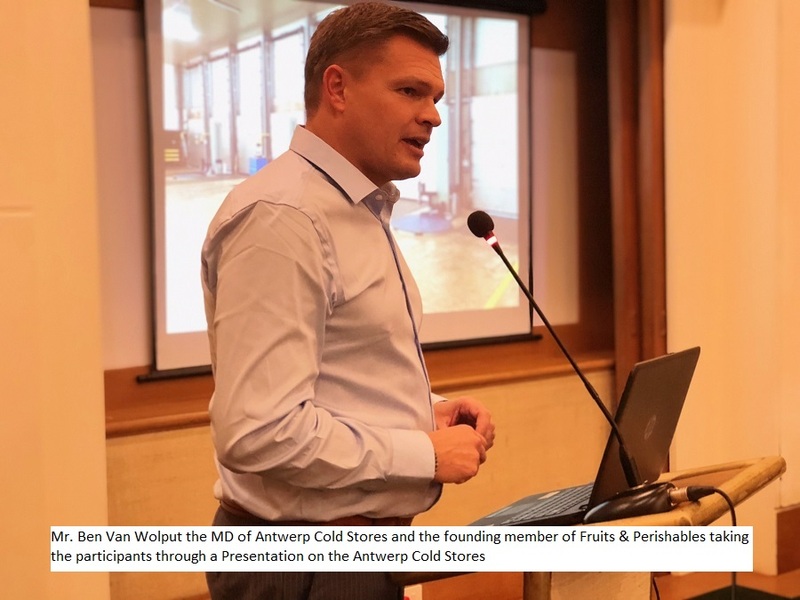 She also introduced Mr. Ben Van Wolput the MD of Antwerp Cold Stores and the founding member of Fruits & Perishables, to the audience. Mr. Alex Ninan, President of the Seafood Exporters Association of India spoke on the occassion. 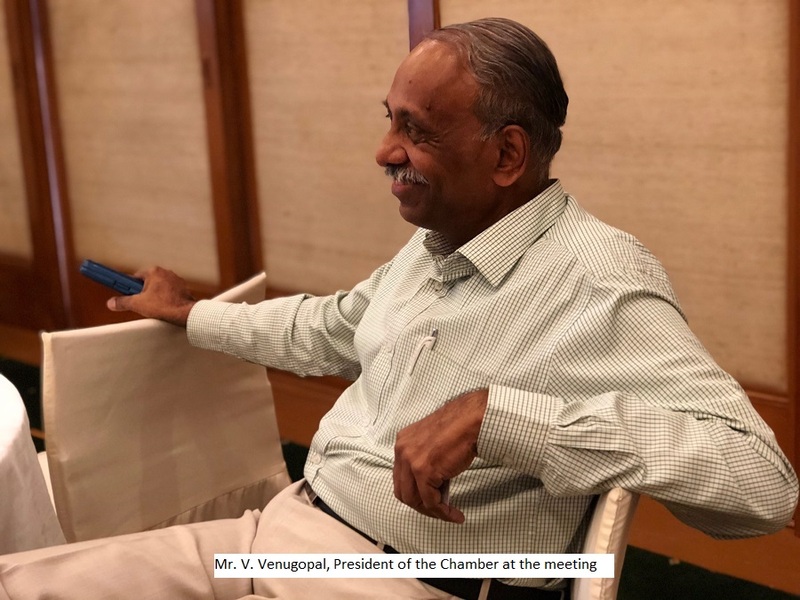 He said that the Sea food Industry in India had its roots in Kochi where the headquarters of many prominent marine organizations including CMFRI, MPEDA and CIFT are located. 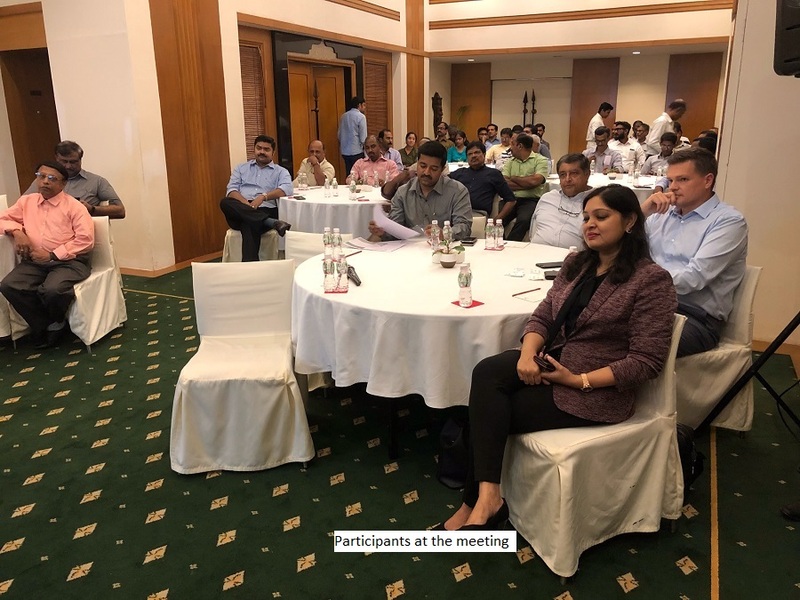 He also reflected on the fact that the people involved in this industry preferred direct contact with the customers though the times have changed with innovative technologies. 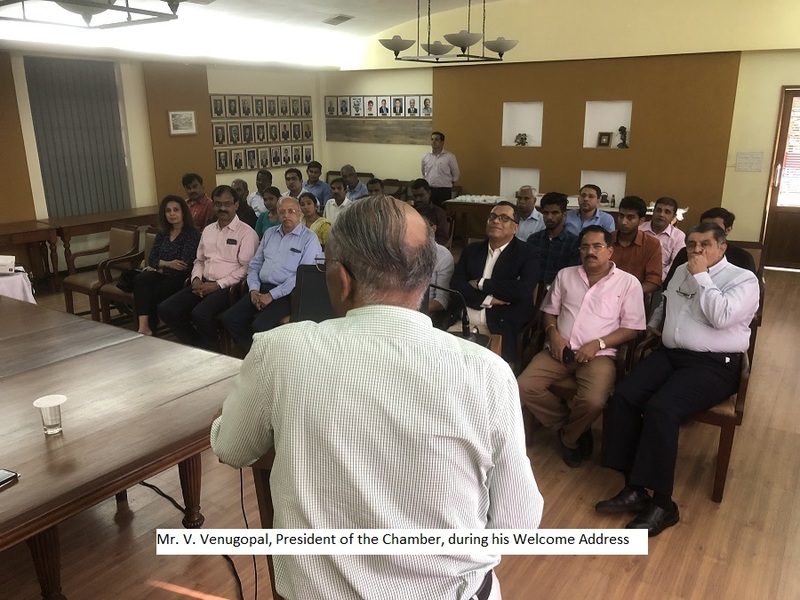 He concluded by saying that the Port of Antwerp acted as a window to the supply chain production for the exporters in Cochin. 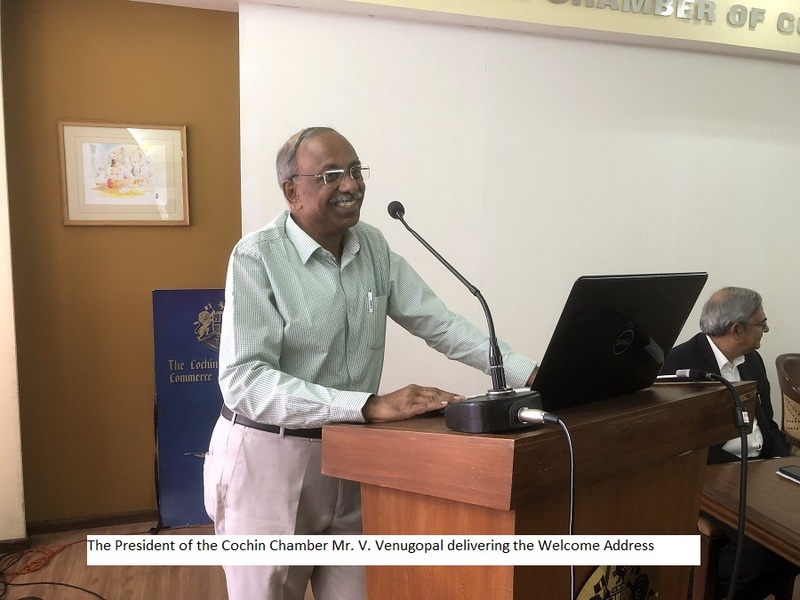 Mr. V. Venugopal, President of the CCCI also spoke on the occasion. Ms. Malini Dutt made a Powerpoint presentation on the Port of Antwerp. She said that the Port was considered as a perishables hub with a 2 million cubic meters of temperature-controlled warehousing capacity. The port handles 7.2 million tonnes of freight with containers, steel, and gasoline being its top three cargos. The Port of Antwerp plays a crucial role in the Belgian economy by contributing 5% to its GDP and provides 149000 jobs in the country. She added that the Port had warehouses that were GDP and ISO certified and offered value-added services including galvanizing steel, sorting, packing and real-time temperature and location monitoring of cargo. It was noted that the Port of Antwerp offered the least terminal handling costs compared to others in Europe. Pre-clearance of the vessel while still at sea, digital procedures, integrated customs, and food inspection services are the other advantages that the Port offers. 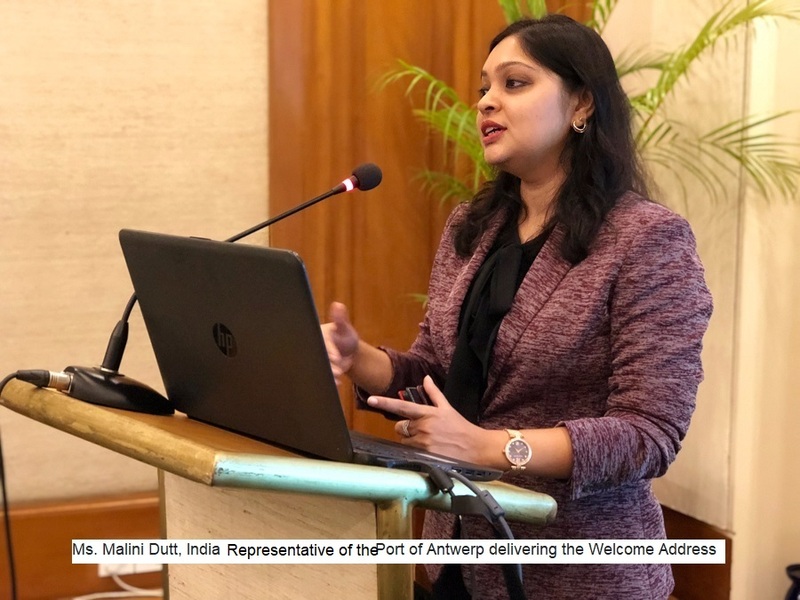 Ms. Dutt said that the Port of Antwerp also acted as a transshipment hub for those exporters looking to send their cargo to countries like Russia and Morocco. The Port of Antwerp acts as a major gateway to UK and Germany because of its strategic location and 46% of its maritime traffic is attributed to Eastern Europe. With an extensive waterway network, barge services, and rail connectivity to central and Eastern Europe, this Port is very well linked to entire Europe thus making it cost-effective and efficient. Mr. Ben Van Wolput also had a presentation for the audience outlining the facilities at the Antwerp Cold Store. It was observed that the changing diet of the emerging nations and a growing demand for European food products increased the import of food into the continent. Antwerp Cold Stores is located on the left bank of the Port of Antwerp and operates on a site of 56.000 square meters. The company accommodates a warehouse which has a capacity of 8500 pallets for frozen foodstuff and 7500 for chilled products. 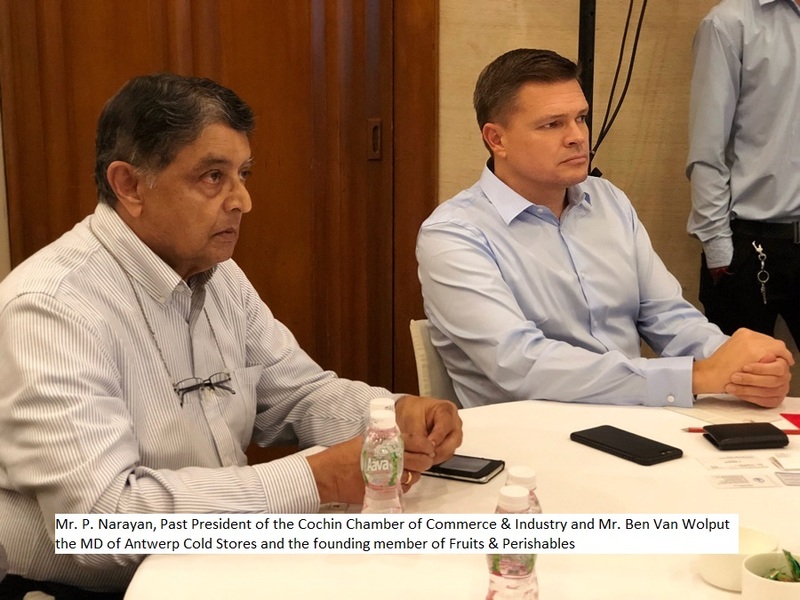 The Antwerp Cold Stores offer solutions for the import of perishable food and agricultural products into Europe via the Port of Antwerp and claims that its business model is commodity-focused. Freight, documentation, handling and storage, transportation and shipment monitoring are the main services offered by the Company. He also compared the import services via the Port of Antwerp namely direct deliveries, import via VAT warehouse and import via a bonded warehouse. 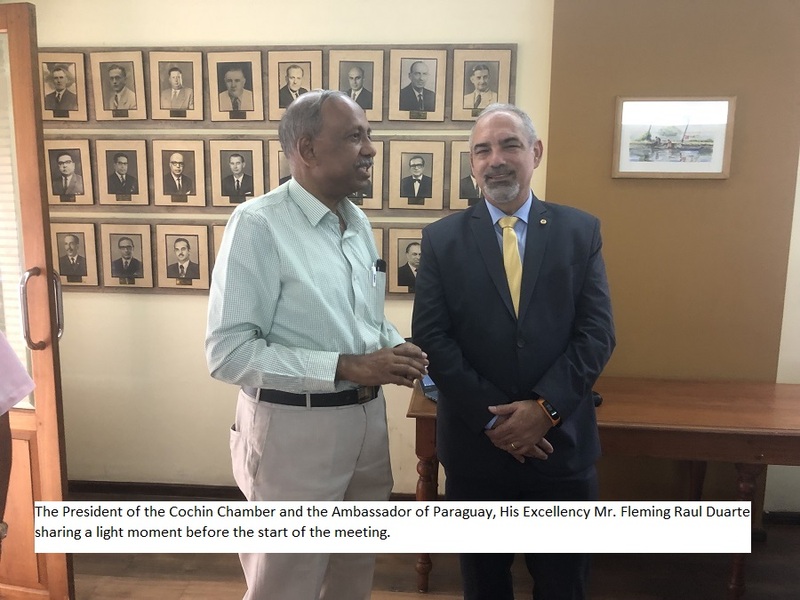 The floor was then open for discussions wherein queries, pertaining to Brexit and also the necessary documents required for sending cargo were discussed. 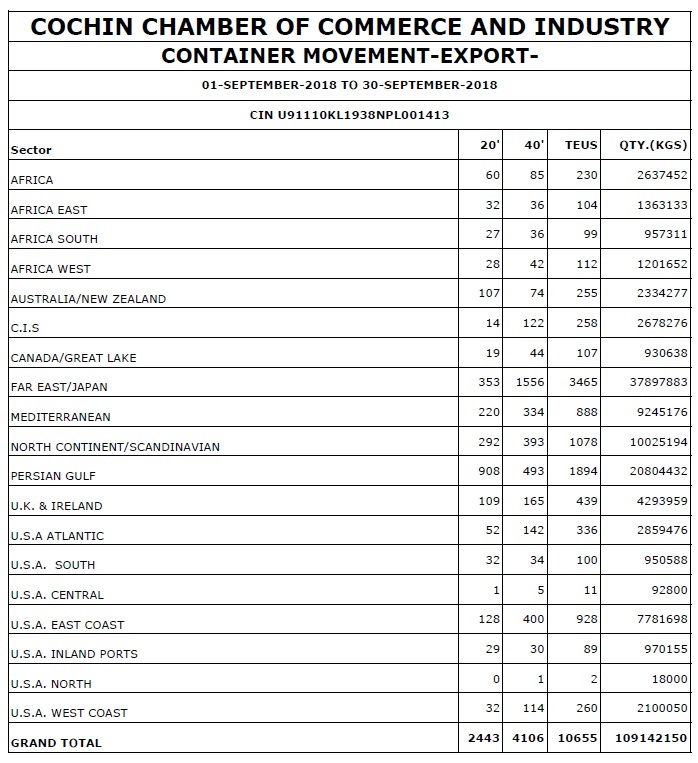 According to Ms. Dutt the Antwerp Cold Stores had an advantage of receiving more cargo that would otherwise have gone to UK thanks to Brexit. Mr. Ben Van Wolput also added that the Antwerp Cold Stores offered a few value added services including wine tasting and even a meeting hall in their office for their clients who wished to meet their end customer .He said that the Port of Antwerp is customer-centric and a far more friendlier port than the other European ports like the Hamburg and Rotterdam. 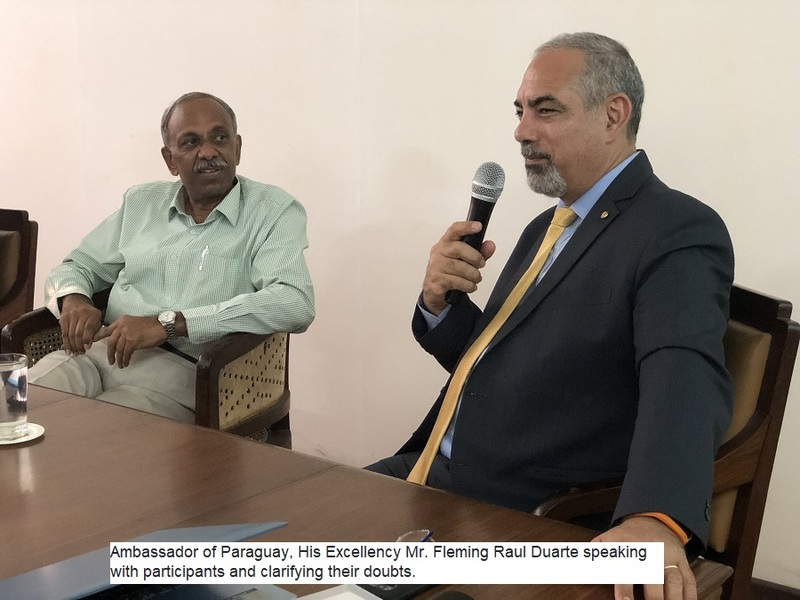 During the discussions he said that their storage facility stocked imported chocolates from Switzerland and also products including butter and milk from New Zealand. 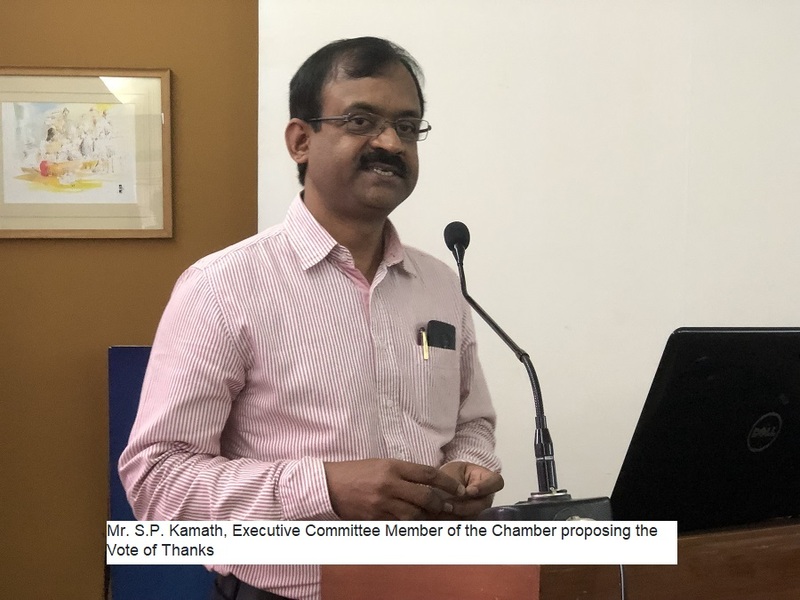 Mr Vijayakumar of FIEO proposed the Vote of Thanks. The Session ended at 6:30 pm. 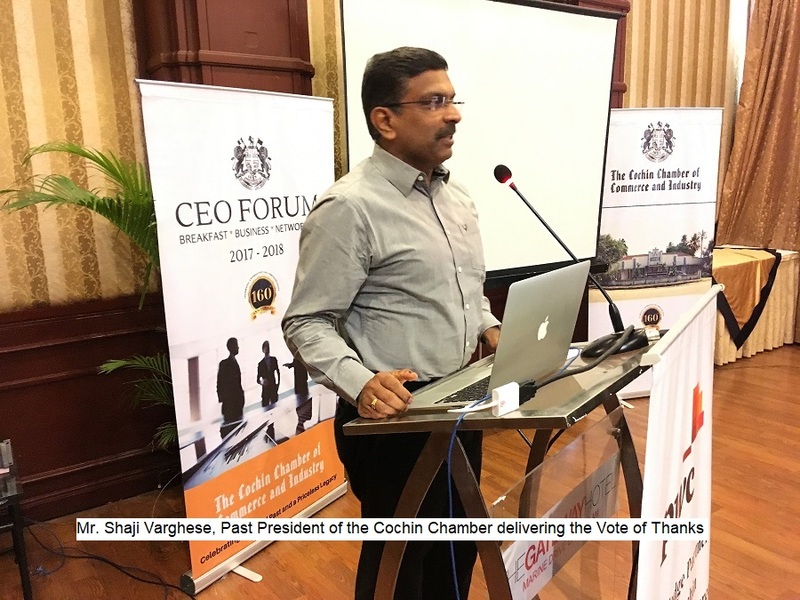 The Cochin Chamber of Commerce and Industry conducted its CEO Forum’s – 13th Breakfast Meeting on Friday, 7th December 2018 at the Taj Gateway Hotel, Ernakulam. The economy of India is a developing one and today it is one of the fastest growing economies in the world and has the potential to be one of the top three global economic powers of the world over the next 10-15 years. 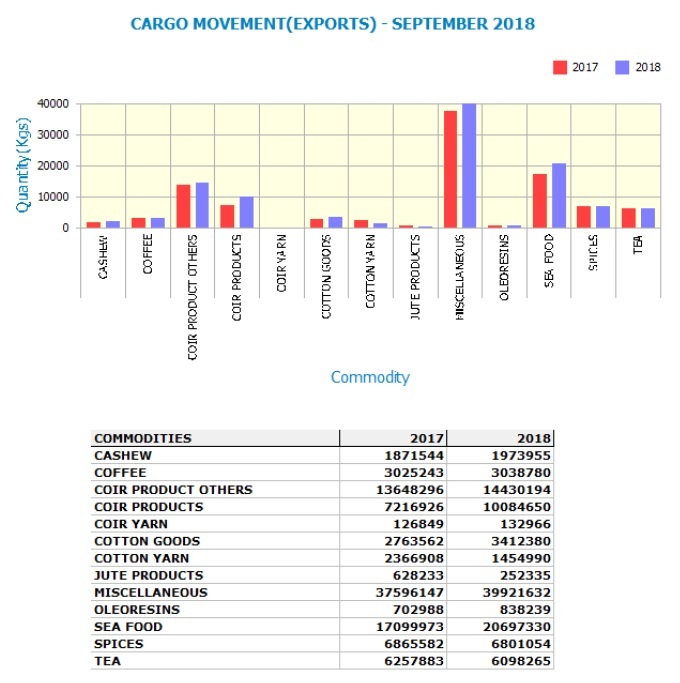 But experts are of the opinion that the economy is in for a slow down due to tight financial conditions, stressed agricultural sector and slower exports. Mr. Mullath gave the meeting an insight into India’s demographics like India’s share of world population, its current population growth, religion, ethnicity, India’s linguistic share vs. the world’s etc. He also mentioned that India contributes 3.27% to the World GDP and also explained its roller coaster ride in the capital markets for the past 34 years. One major revelation is that the Indian households have more gold than the total gold reserves of the USA, Germany and the IMF, he said. As per latest data, the Indian economy grew at the slowest pace in three quarters at 7.1% GDP growth. But with effective reforms and techniques, India could bounce back. Mr. Mullath explained in detail how India could improve its economy. India is a country where unemployment is still an issue despite having a considerable literacy rate. 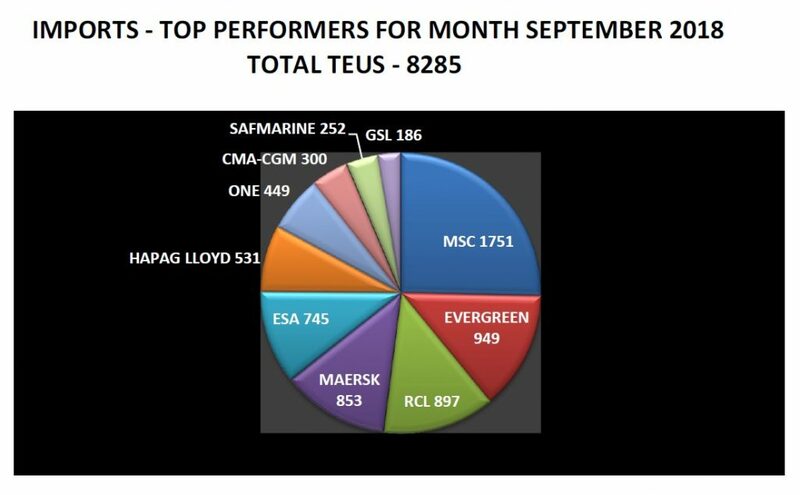 Most of the employment generators have underperformed. In the case of investments also India is below par. Despite the facilitations, the investment cycle is elusive, he said. Mr. Mullath explained the importance of manufacturing and how it can improve our GDP rate. With proper measures it can contribute 25% to GDP by 2022. Economists have said that the GDP deflator for agriculture is negative for the first time in many years. The farmers are earning less than what they were before. In this situation, by providing minimum support price and proper aid, the rural economy can be brought up. We live in a digital age where anything and everything is at our finger tips. As per a World Bank study, 80% Indian adults own a mobile phone, equalling China. With proper measures and care, technology is one field which can be a major contributor to the Indian economy even though there are challenges in enhancing digital infrastructure in the country. 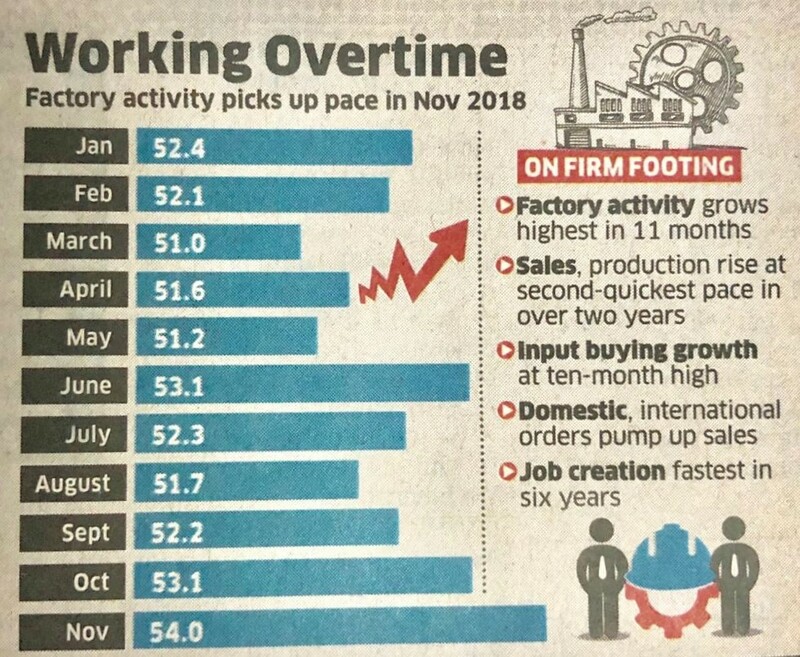 While naysayers say that the economy is on a downward spiral, optimists point out that India has experienced a shift of gears with the introduction of several policies. Depending on what we read and whom we listen to, we may conclude that the Indian Economy is either Half Full or Half Empty. 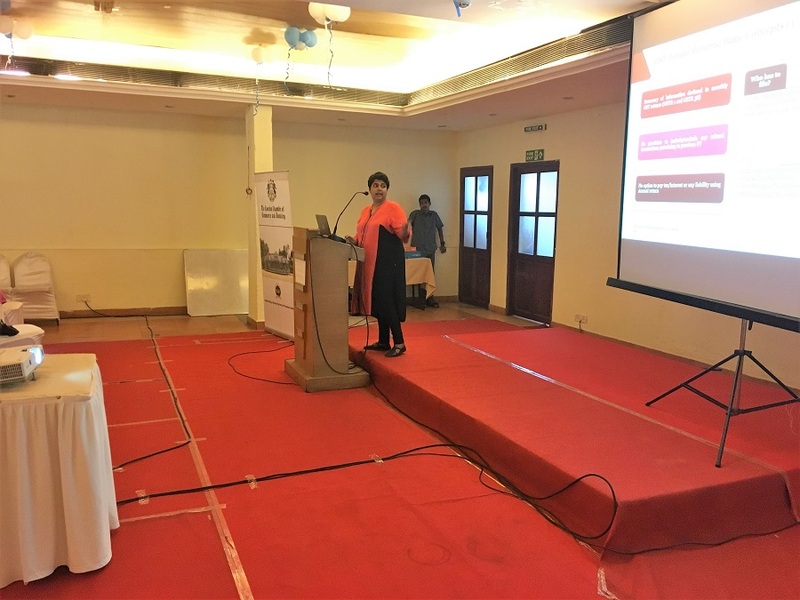 Ms. Nisha Menon, Director-Tax, PricewaterhouseCoopers India in her ‘Quick Bytes’ provided some important tips on the Simplified GST Returns. Mr. C.S. Kartha, Past President of the Chamber, presented a Memento to Mr. Manoj Mullath. 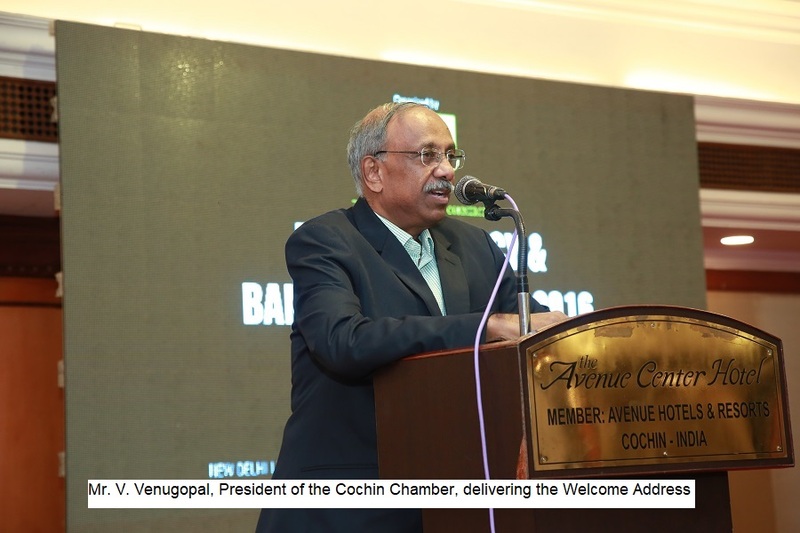 Mr. Shaji Varghese, Past President of the Chamber delivered the Vote of Thanks. 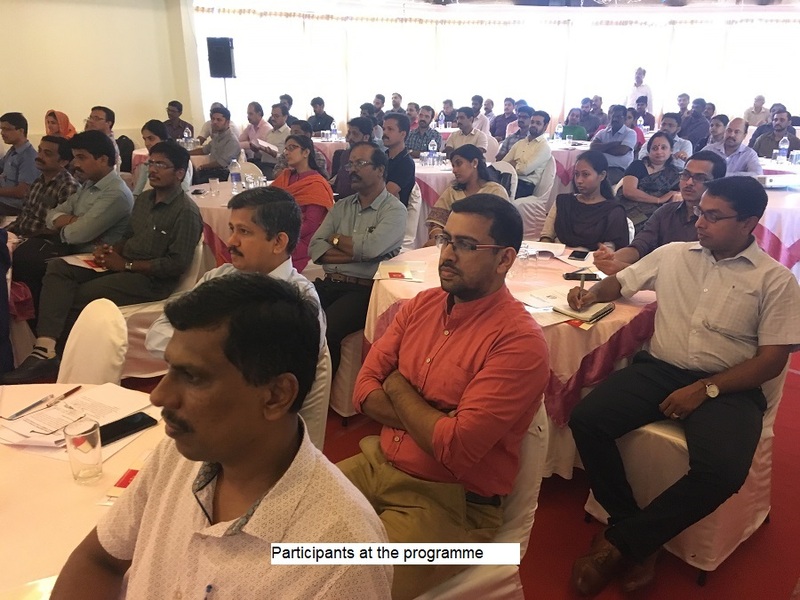 The Cochin Chamber of Commerce and Industry organized a Workshop on “GST Audits and Annual Returns: An Overview” on Saturday the 8th of December, 2018 at Hotel Park Central, Ernakulam. 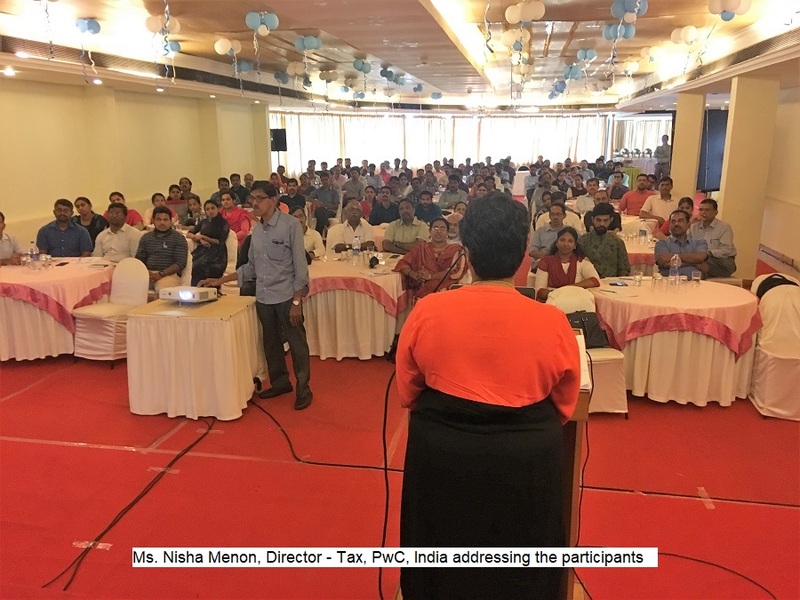 The Workshop was led by Ms. Nisha Menon, Director, Tax – PwC India. Mr. S.P. 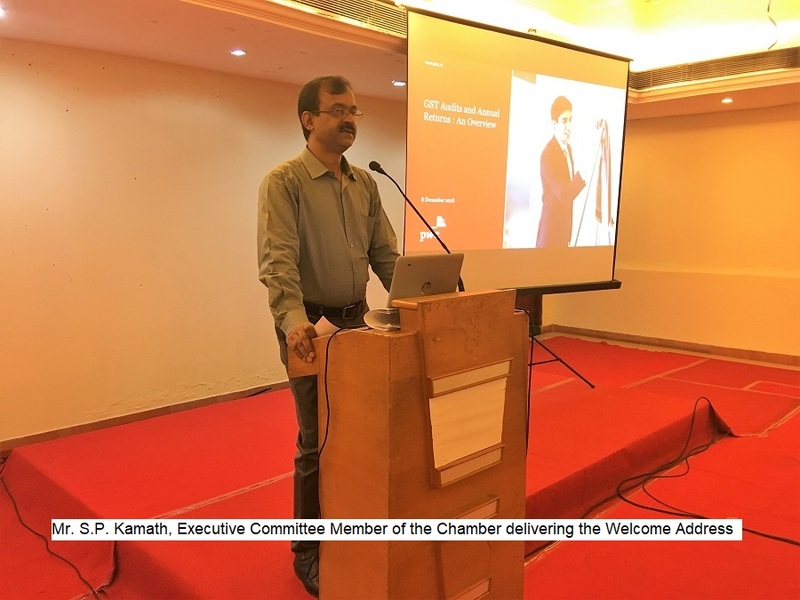 Kamath, Executive Committee Member, CCCI delivered the Welcome Address. 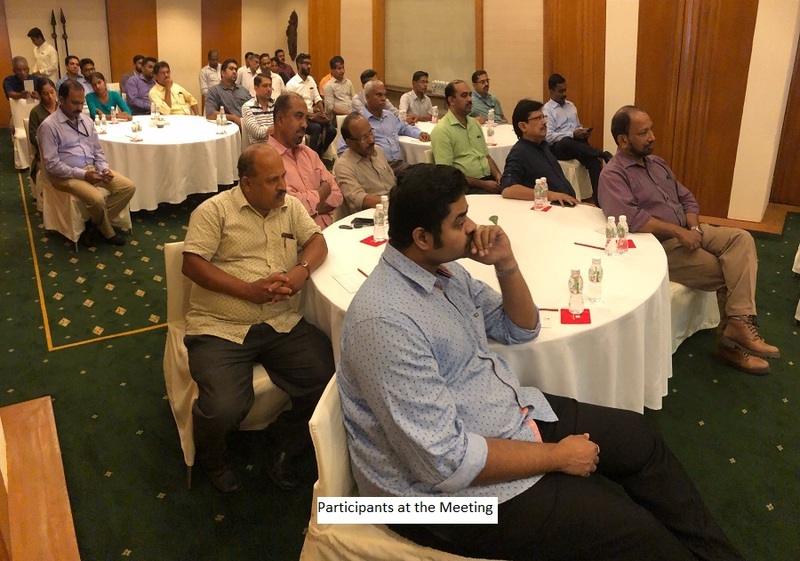 The Workshop was organized with the intention of providing a clearer picture on the GST annual returns filing and the latest updates on the GST front. The 115 participants represented over 110 organizations and included manufacturing, shipping, finance, export industries etc. Ever since GST came into effect from 1st of July, 2017, there were several anticipations for the GST Audit and it’s reconciliation with the annual return. Made available by Government in September this year, the forms require businesses to not only consolidate the information that they have been filing in their monthly returns but also to reconcile it. Ms. Menon gave the participants an insight into the basic concepts of GST Annual Returns. Every registered person is required to file the Annual Returns whereas an input service distributor or a casual taxable person need not. She also mentioned the penalty for the failure to file GST Annual Returns. Ms. Menon touched upon the details to be provided in the Annual Returns namely; Inward and Outward Supplies, Input Tax Credit, Tax Paid etc. She also mentioned the audit requirements, the prescribed limit and format of the audits, suppression and the joint liability of Directors of a private company. GSTR 9C is the GST reconciliation statement for a particular financial year to be filed by the tax payers. Ms. Menon gave a detailed explanation of the format of the GSTR 9C which includes the Reconciliation of Turnover, Reconciliation of Tax Paid, Reconciliation of ITC, Additional Liability etc. 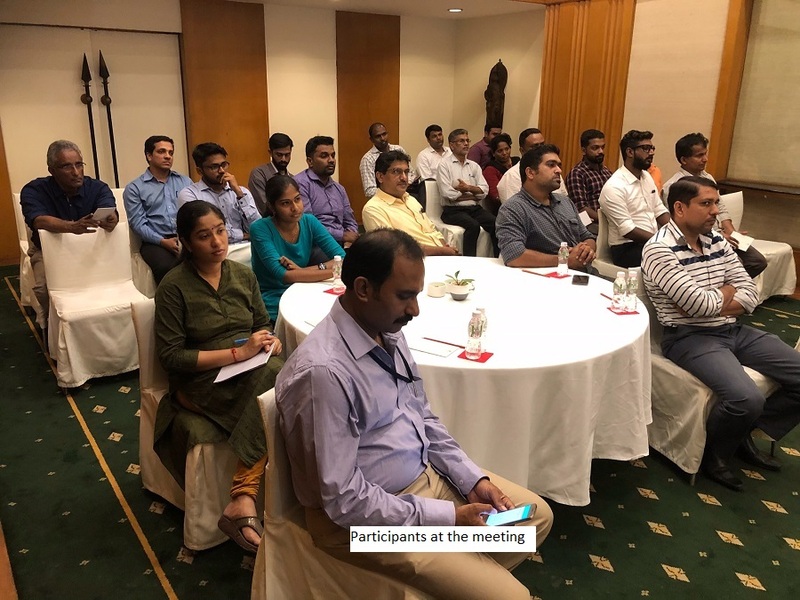 The session also covered the accounts and other records to be maintained, what to expect out of a GST Annual Audit Programme and how to prepare for the audit procedures in detail. 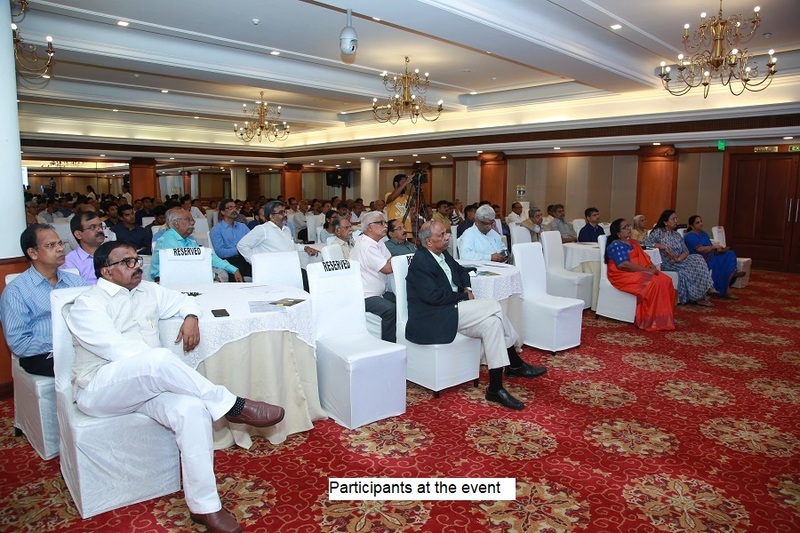 Following this, there was a question and answer session where the participants cleared their doubts regarding the GST Annual Returns. 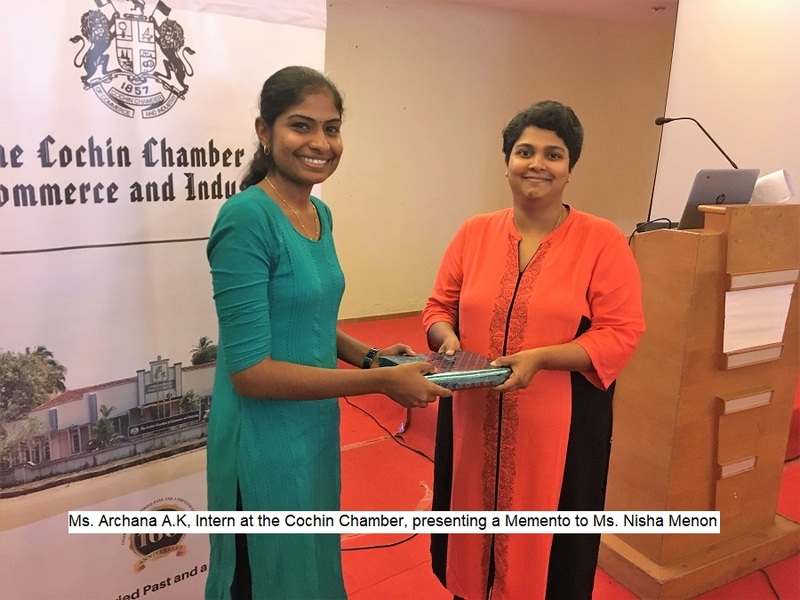 Ms. Archana A K, Intern, Cochin Chamber of Commerce and Industry, presented a Memento to Ms. Nisha Menon. 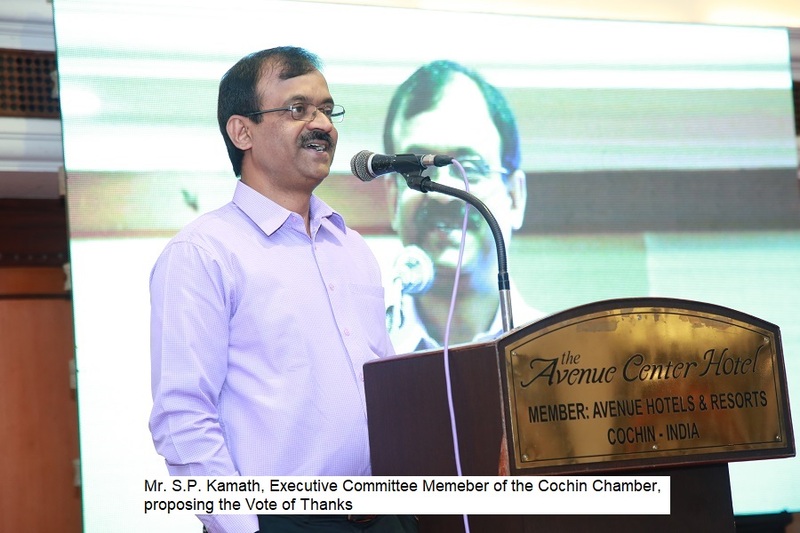 Ms. Vanidevi, Intern, Cochin Chamber of Commerce and Industry proposed the Vote of Thanks. Recently, the Delhi bench of the Income-tax Appellate Tribunal (Tribunal) held that the taxpayer (formed for organizing an international sports event) was liable to withhold tax under section 194C of Income-tax Act, 1961 (Act) on amount tendered as advances to various public sector undertakings (PSUs) to conduct infrastructure work for the winter games. The Tribunal rejected the taxpayer’s plea that it was merely a pass-through entity that had received grants/ sponsorships for organizing the winter games and that it did not enter into any contract with the parties to whom payments were made. The Tribunal further clarified that merely because the taxpayer was provided grants for onward distribution to the parties carrying out the construction work did not exclude it from the liability of withholding tax under section 194C of the Act. PwC comments: The Tribunal has considered the overall essence of the transaction while holding that the taxpayer was liable to withhold tax under section 194C of the Act, even in a case where no contract existed between the payer and the payee. The ruling has also reaffirmed the position that no AOP is constituted if all members of consortium are responsible for their work; payments are made directly to these parties, each party is individually charged to tax on their profit, and common management is only for administration convenience. 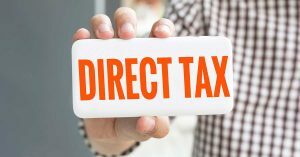 In a recent ruling, the Mumbai bench of the Income-tax Appellate Tribunal (Tribunal) reaffirmed the principle that “setting up” of business, and not “commencement” thereof, is relevant under the Income-tax Act, 1961 (the Act) for the purpose of claiming revenue expenditure as deductible. The taxpayer was incorporated to manage assets of a mutual fund regulated by the Securities and Exchange Board of India (SEBI). Upon incorporation, it took various steps to commence its business activities. Revenue expenditure incurred by the taxpayer after incorporation was deductible. PwC comments: Determination of the date of setting up/ commencement of business and deductibility of revenue expenditure thereafter has been a vexed issue. The Tribunal ruling supports a view that in the context of the service sector, undertaking various steps to commence business could tantamount to “setting up” of business. Hence, revenue expenditure incurred thereafter should be allowable. In a recent decision, the Delhi bench of the Income-tax Appellate Tribunal (Tribunal) held that income from leasing of warehouse has to be assessed under the head “income from house property” and not as “income from business or profession”. The reliance placed by the taxpayer on the clauses in the memorandum of association (MoA) holds no force, and the dominant object of the rent agreement was only to enjoy rental income. 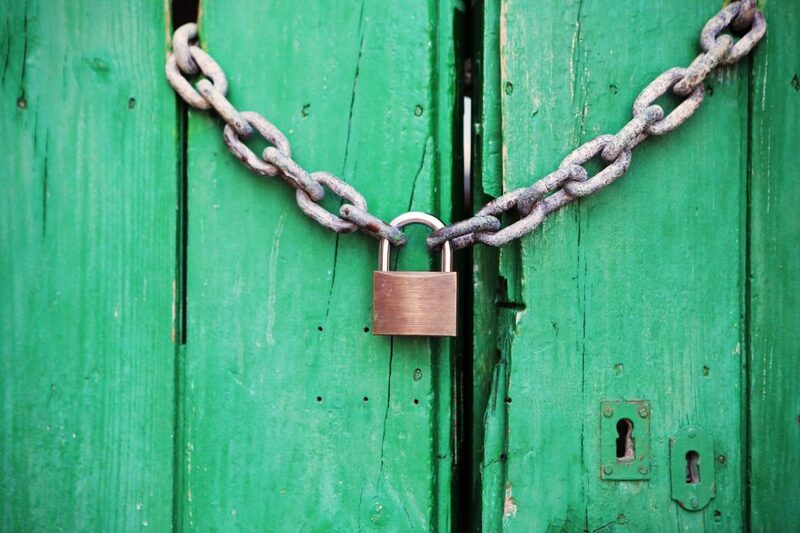 The Government of Haryana has issued guidelines regarding circumstances in which input tax credit (ITC) can be blocked/ unblocked from the electronic credit ledger. GSTN has recently released an application program interface for the functionality of blocking and unblocking of ITC by the authorities on GSTN. The necessary backend application for the aforesaid has been integrated into the systems of the tax office. Where registered assessees are found to be bogus or fake as a result of any investigation or intelligence. Where the firms are found to be non-functional. Transitional Credits claimed through TRAN-1/ TRAN-2, in excess of lawful entitlement. Credit to be blocked only to the extent of excess credit claimed. Credit of supplies not used in the course of or in furtherance of business, to the extent of inadmissible credit, if on examination of returns, such cases are detected. Inadmissible credits as per section 17(5) of the CGST Act, 2017, to the extent of inadmissible credit, if on examination of returns or otherwise, such cases are detected. Where assessees are not entitled to credits in accordance with the law, to the extent of inadmissible credit. These scenarios could be if the tax is not paid by the supplier, the recipient is not in possession of the tax invoice, or the supply is outdated or the supplier is composition assessees etc. PwC Comments: There does not seem to be any provision in the GST laws allowing the authorities to unilaterally block the ITC of businesses. There is a statutory process outlined for adjudication of credit wrongly claimed, which entails the due process of issuance of notice and assessment proceedings and an opportunity of being heard for the businesses, before any amount can be recovered. However, this guideline seems to be quite generic; while the intention seems to safeguard government revenues, given the manner in which it is worded, there is a possibility of this guideline being used to bypass the statutory process. Such step of blocking credits on the GST portal should be adopted only pursuant to any investigation or examination, and not without any concrete grounds and prior approvals from senior authorities. There are already instances, where input credits are sought to be blocked, where the issue pertains to pending VAT assessments (for a period prior to GST). The GST Council should immediately look into this guideline and issue detailed instructions on the situations in which such credit blockage step can be invoked by the authorities. If this issue is not addressed immediately, it could lead to enormous litigation and hardship for the businesses. The applicant had entered into an agreement with an overseas client (engaged in trading of chemicals) for providing back-office services such as documentation & administrative support in respect of contracts, maintaining employee records of overseas clients, payroll processing, etc. The applicant was remunerated either on a fixed monthly basis or as per the volume of transactions, on mutually agreed terms in convertible foreign exchange. The AAR has held that a perusal of the service agreement indicates that the applicant arranges or facilitates the supply of goods between the overseas client and the customers of the overseas clients and thus, would qualify as an ‘intermediary’ under the provisions of the IGST Act, 2017. The place of supply of such services should, therefore, be determined in accordance with section 13(8) of the IGST Act, 2017 which is the location of the supplier of service i.e. in India. Considering that the place of supply of service is in India, the conditions stipulated to qualify as export of service have not been fulfilled, and thus would not qualify as a ‘zero-rated’ supply as per section 16(1) of the IGST Act, 2017.composition assessees etc. PwC Comments: The ruling is fact specific (in terms of activities undertaken by the applicant) and the AAR has summarily held that the applicant qualifies as an intermediary. 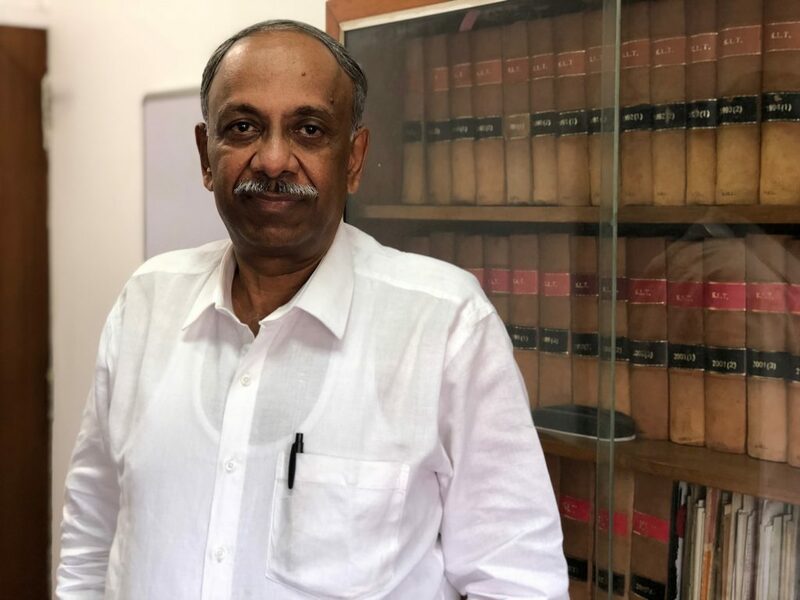 Recent advance rulings under GST law have held that determination of ‘place of supply’ is not a qualifying question which can be raised in such proceedings, though there have been contrary rulings too. In this case, the AAR has commented on the place of supply of transactions; even though the provisions of section 97(2) of the CGST Act, 2017 indicate that it is not covered in the list of questions on which an advance ruling can be sought. Moreover, the applicant had argued that the services rendered qualify as a composite supply wherein the back-office support service is the principal supply and the facilitation of supply of goods is incidental. In essence, the applicant did not seem to be involved in the facilitation of any supply but merely in the back-end support activities. This seems to be supported by the fact that the role of the applicant began only after finalization of deals by the overseas client with its customers and it is not acting as a broker or agent. Subject to appeals, while this advance ruling is binding only on the applicant and its jurisdictional officers, it is possible that this ruling may be referred by the revenue authorities while dealing with similar situations. The applicant, a non-banking financial company, was inter alia engaged in providing loans. The loans were repayable by way of equated monthly instalments (EMI) through cheques/ ECS, etc. On dishonor of cheques/ ECS, etc. the applicant collects penal/ default interest for the delay committed by the customer. The applicant contended that such interest is exempt by virtue of Sr. No. 27 of Notification No. 12/ 2017-Central Tax (Rate), which exempts services by way of extending loans in so far as the consideration is represented by way of interest. Also, the penal interest collected from the customer is in the nature of additional interest on a new loan (i.e. defaulted EMI), and not subject to GST. Further, it cannot be treated as a payment for toleration of an act of delay in payment by the customer. PwC Comments: This ruling adopts a position that appears contrary to the approach adopted historically by the financial services industry as no differentiation between ‘general’ and ‘penal’ interest from an indirect tax perspective has been adopted. While the ruling is binding only on the applicant and its jurisdictional officers (subject to appeal), this creates another area of potential dispute and the industry may need to represent this issue to the CBIC. Presently GSTN does not allow an assessee to file fresh refund application once a deficiency memo has been issued against an earlier refund application for the same period. Hence, till the time such facility is developed, assessees are required to submit the rectified refund application under earlier application reference number only. Further, in case of issuance of deficiency memo, no re-credit of the amount of input tax credited in the electronic credit ledger is required. A suitable clarification would be issued to address the cases where the re-credit is already made. Rule 96(10) of the CGST Rules, 2017 restricted the refund of IGST paid on exports if the exporter had claimed the benefit under certainly specified notifications. The rule has been amended and the net effect of the amendment is that any exporter who imported goods by claiming benefit under customs notification nos. 78/2017 and 79/2017 can claim the refund of IGST paid on exports till 9 October 2018 when rule 96(10) of the CGST Rules, 2017 was amended by notification no. 54/2018-Central Tax. After the amendment, such exporters will not be able to claim a refund of IGST paid on exports, except for the exporters receiving capital goods under the EPCG scheme. Excess ITC distributed by an input service distributor (ISD) would be recovered from the recipients along with interest and penalty if any. Further, the ISD would also be liable to a general penalty under section 122(1)(ix) of CGST Act, 2017. A wholesaler or retailer, returning the expired medicines can treat it as a fresh supply and issue an invoice for the same. The recipient of such supply (manufacturer/wholesaler, respectively) can claim the ITC of such GST. A composition taxpayer can return the expired medicines by issuing a bill of supply and pay tax at rate applicable to a composition assessee. 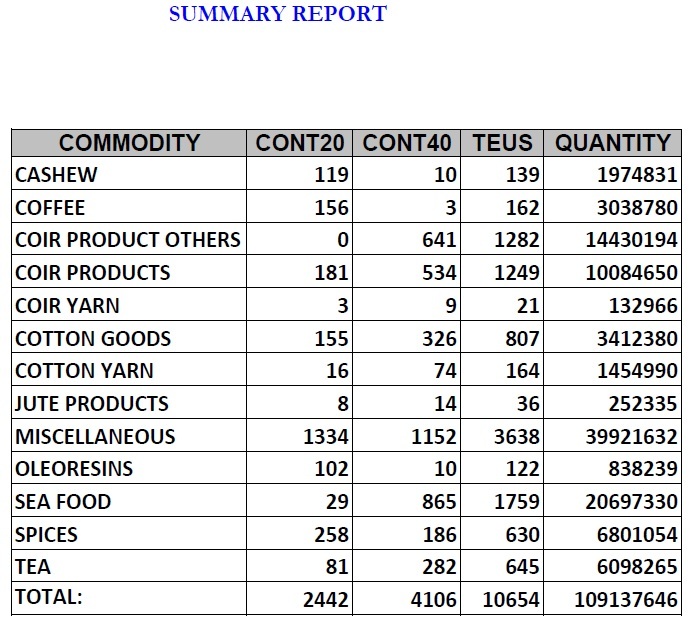 The recipient of such supply cannot claim ITC. Unregistered person can return expired medicines by issuing any commercial document, without charging any tax. After receiving such time expired medicines, when manufacturer destroys the same, it is required to reverse the ITC availed (of tax charged by person returning it) as per section 17(5)(h) of CGST Act, 2017. The manufacturer will not be required to reverse the ITC attributable to the manufacture of such time expired goods. As an alternative to above procedure, the supplier can issue a credit note to the person returning the goods. The person returning such expired medicines can return it by issuing a delivery challan. If credit note is issued within time limit specified in section 34(2) of the CGST Act, the supplier can adjust his tax liability, if the person returning the medicine has either not availed ITC or reversed the ITC, if availed. A credit note can still be issued if the time limit specified in section 34(2) of the CGST Act has lapsed. However, the supplier cannot adjust the tax liability. It is also clarified that in such cases, there is no requirement to declare such credit note on GSTN by the supplier. The manufacturer will be required to reverse the ITC attributable to the manufacture of such goods at the time of destruction of such time expired medicines. Further, this circular is applicable to such other scenarios where the goods are returned on account of other reasons. 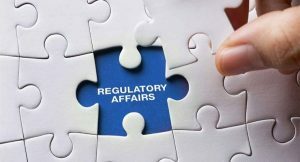 PwC Comments: The issuance of clarifications on various issues would resolve certain operational ambiguities for the industry. The pharmaceutical industry may need more clarity in terms of the appropriate State, where the credit in respect of goods destroyed needs to be reversed, i.e. whether in the State where such goods were originally manufactured or in the State where the goods are destroyed, since they may be different. The Companies (Amendment) Ordinance, 2018 received the President of India’s assent bringing into force further amendments to certain provisions of the Companies Act, 2013 (Act) with effect from 2 November 2018. The Ordinance promulgated is based on the recommendations made by the Committee appointed by the Government to review offenses under the Act. The key amendments are analyzed below. A declaration is filed by a director within 180 days of the date of incorporation, confirming that every subscriber has paid up the value of shares agreed to be taken. The company has filed the verification of its registered office with the registrar. In case no declaration is filed within 180 days of incorporation and the registrar has reasonable cause to believe that the company is not conducting any business or operations, the registrar may initiate the removal of its name from the register of companies. The registrar has the power to conduct physical verification of the registered office and initiate strike-off of the company if there is reasonable cause to believe that the company is not conducting any business or operations. In case of charges created before 2nd Nov’18, the registrar may, on application by company allow registration of the charge, within 300 days of such charge creation. If the registration is not made within 300 days, the registration of charge can be made within 6 months from the date of commencement of the Ordinance. In case of charges created after 2nd Nov’18, the registrar may, on application by the company allow registration of the charge within 60 days of such charge creation. If the charge is not created within the aforesaid period, the registration shall be made within an additional period of 60 days after payment of such ad-valorem fees. Considering the importance of disclosure, the punishment for non-compliance is enhanced to the effect that the contravention is punishable with fine or imprisonment (up to one year) or both, instead of being punishable with only a fine. In case the rights of a shareholder have been suspended by the NCLT for not providing disclosure, the company or person aggrieved by its order may make an application to it for relaxation or lifting of restrictions within a period of one year from the date of order. The issue of shares at a discount. Non-filing of annual return within the due date. 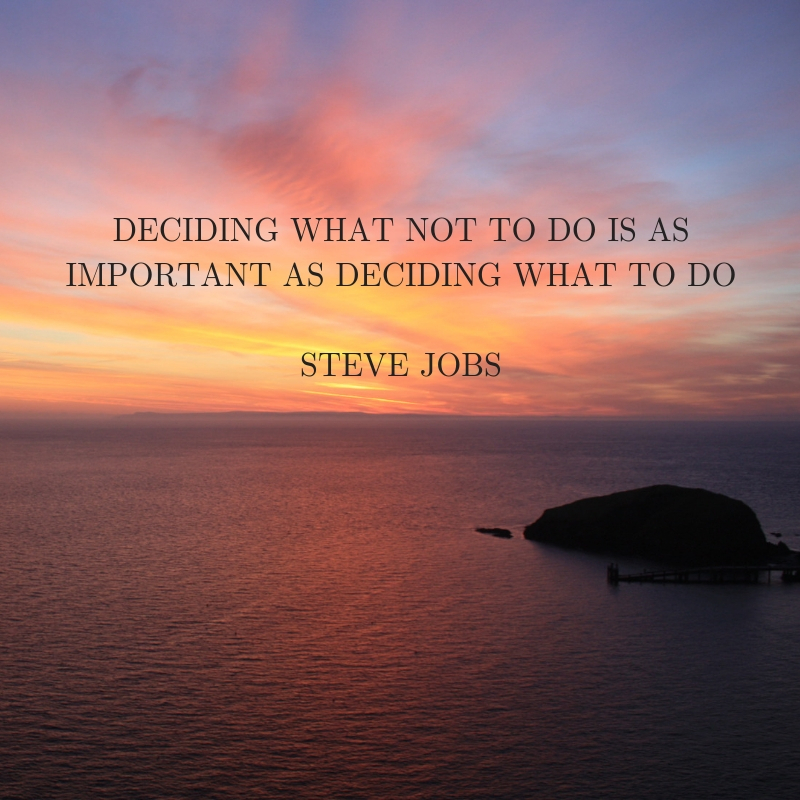 Failure/ delay in filing a financial statement. Contraventions related to Director Identification Number. Failure/ delay in filing certain resolutions. Failure/ delay in filing a statement by the auditor after resignation. Appointment of Key Management Personnel in a certain class of companies. 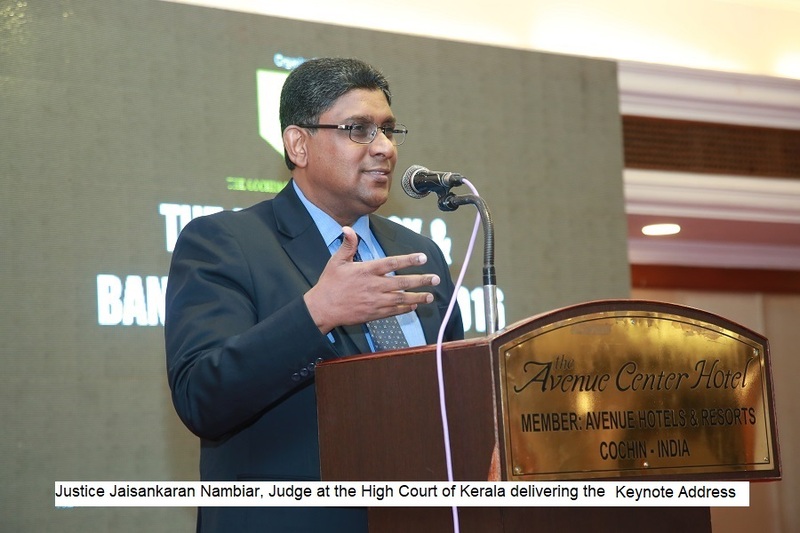 Offences (with only fine/imprisonment), where the maximum fine is up to INR 2.5 million, will be compounded by the Regional Director (RD) of the National Company Law Tribunal (NCLT). The earlier limit was up to INR 0.5 million only, and any matter beyond such limit had to be compounded with the NCLT. The applications for change of financial year and conversion of a company from public to private are now to be made to the 1Central Government instead of the NCLT. Pending applications with the NCLT submitted prior to 2 November 2018 in case of the above matters will be dealt with by the NCLT. Re-categorization of certain offenses, which are in the category of compoundable offenses to an in-house adjudication framework, wherein defaults would be subject to the penalty levied by an adjudicating officer. De-clogging the NCLT by introducing certain amendments & enhancing the role of the RD. The EPFO has amended rules to allow subscribers to withdraw up to 75% of the accumulated EPF corpus after one month of quitting a job. The subscriber can withdraw the remaining 25% after unemployment for more than two months. 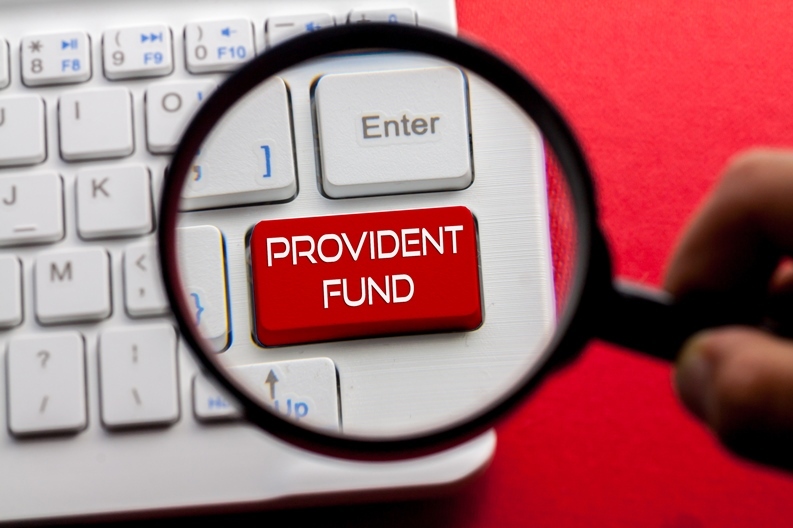 Over the years, retirement fund body Employees’ Provident Fund Organisation or EPFO has eased the process of employee provident fund or EPF withdrawal. Now, an EPFO subscriber can apply for EPF withdrawal online and the time taken for the money to be credited to the subscriber’s account has reduced considerably. But financial planners advise against early withdrawal of the EPF corpus, which, they say, is meant for post-retirement years. 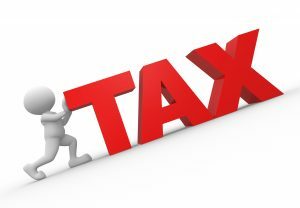 To discourage early withdrawal, the government has formulated income tax laws accordingly. The EPFO has amended rules to allow subscribers withdraw up to 75% of the accumulated EPF corpus after one month of quitting a job. The subscriber can withdraw the remaining 25% after unemployment for more than two months. 1) EPF withdrawal is taxable if an employee does not render continuous services for a period of at least five years. 2) In case of a job switch, if EPF is transferred to another employer, the new employer’s period of employment is also included to calculate the continuous period. 3) If the total period of service is less than five years, accumulated EPF balance withdrawn becomes taxable in the financial year of withdrawal. 4) It is to be noted that there are four parts to any EPF contribution— employee’s contribution, employer contribution and interest earned from both employer’s contribution and employee’s contribution. 5) In case the period of continuous service is less than five years, the sum total of the employer’s contribution to EPF and interest earned on it is taxable under the head “salary” in the subscriber’s income tax return. 6) The subscriber’s own contribution portion of the withdrawal is not taxable. But if the subscriber had claimed deduction under Section 80C on his contribution in earlier years, it becomes taxable under salary. It is to be noted that the EPFO subscriber’s own contribution towards EPF is eligible for deduction under Section 80C of the Income Tax Act. 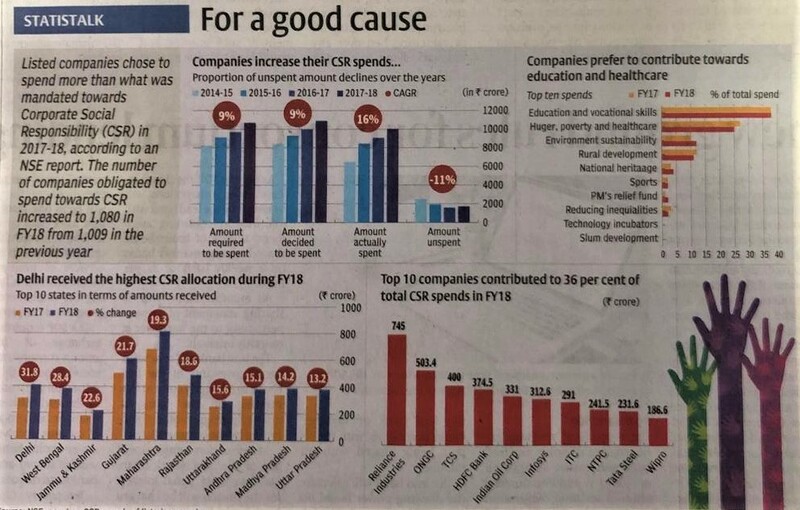 7) The interest earned on the subscriber’s own contribution portion is taxed under ‘income from other sources’. 8) On withdrawal before five years of continuous service, TDS or tax deducted at source @10% is levied. 9) But in a few cases, such as if amount is less than Rs 50,000 or employer closing down the business, TDS is not levied. 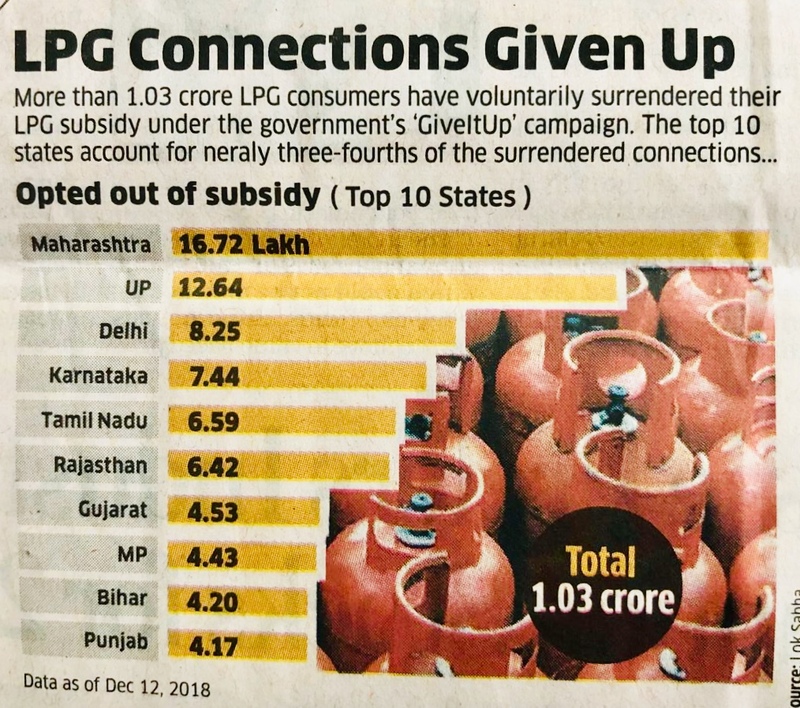 10) If the amount is more than Rs 50,000, and period of service is less than five years, the subscriber can submit Form 15G/15H to avoid TDS in cases where the income for that year is below the taxable limit. Form 15H is for senior citizens (60 years and above) and Form 15G is for individuals having no taxable income. 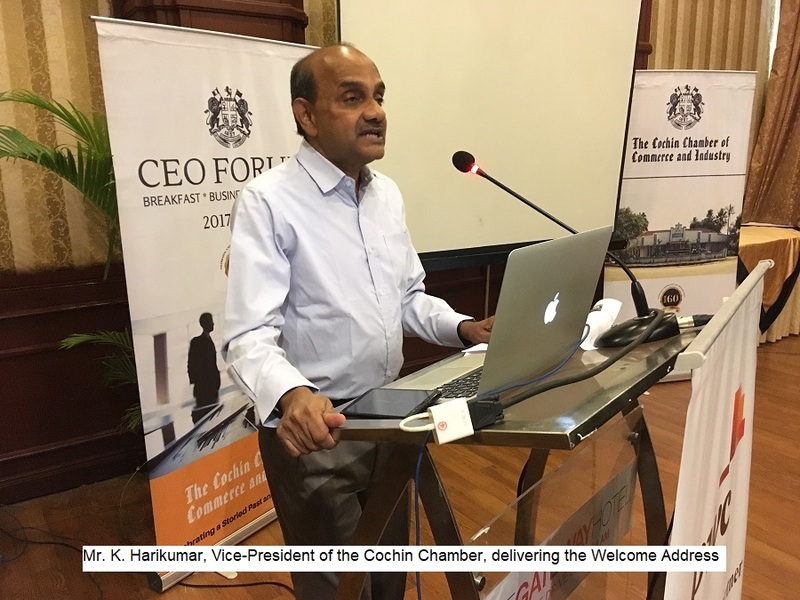 We are happy to inform you that the CEO Forum Breakfast Meetings of the Cochin Chamber is entering its fourth year. 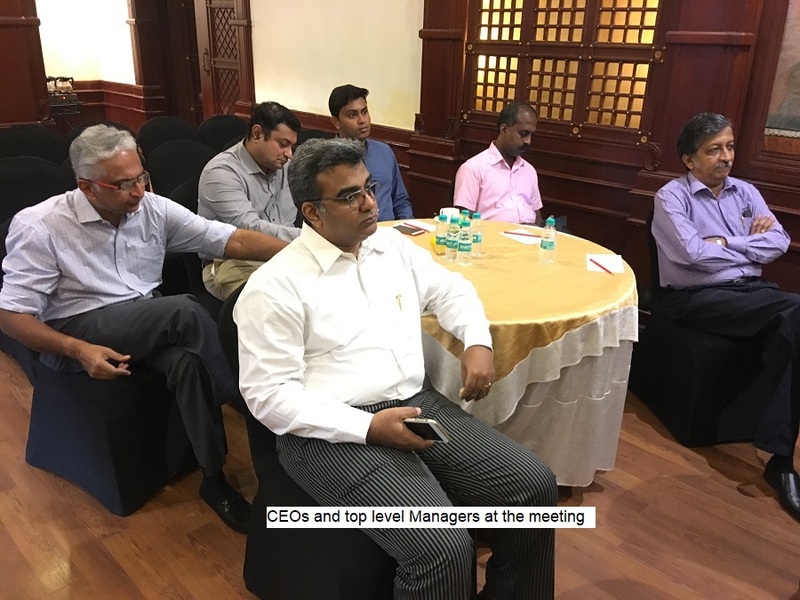 From small beginnings in the year 2015, we now have regular monthly meetings of the CEO Forum which we understand has become accepted in the Business Circles of Cochin. We are now pleased to announce that the Fourth Edition of the CEO FORUM – BREAKFAST MEETINGS will commence from January 2019. 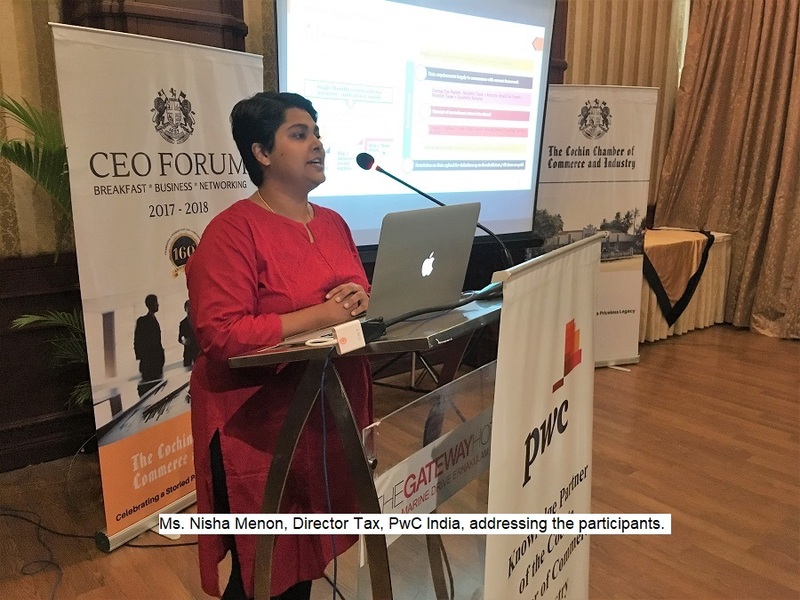 PricewaterhouseCoopers, India will once again be our Knowledge Partner for the CEO FORUM Breakfast Meetings. As always, the CEO FORUM Breakfast Meetings will be held on the First Friday of each month, commencing Friday, the 4th of January 2019. Please do register and avail this opportunity to become a member of the Chamber’s CEO Forum and attend its meetings regularly. 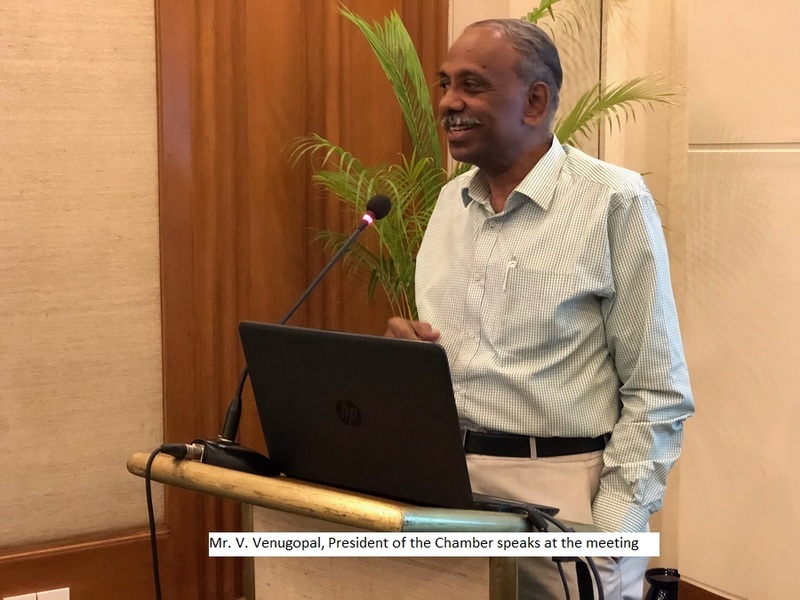 Following the presentation of the Union Budget 2019 in Parliament on the 1st of February, the Chamber will be organising the next Annual Post Budget Analysis 2019 – 2020 on the 4th of February 2019. Mr. Homi P. Ranina will be the Speaker at the session. More details on this programme will be shared in due course. We call on the students from B-Schools, Engineering Colleges, and Degree Colleges, to participate in this Workshop to help themselves identify, develop and hone their skills so as to improve their employability prospects and position themselves for selection by the best of organisations at the start of their careers. Should you have any queries regarding the Workshop please direct them to the Chamber Secretariat. 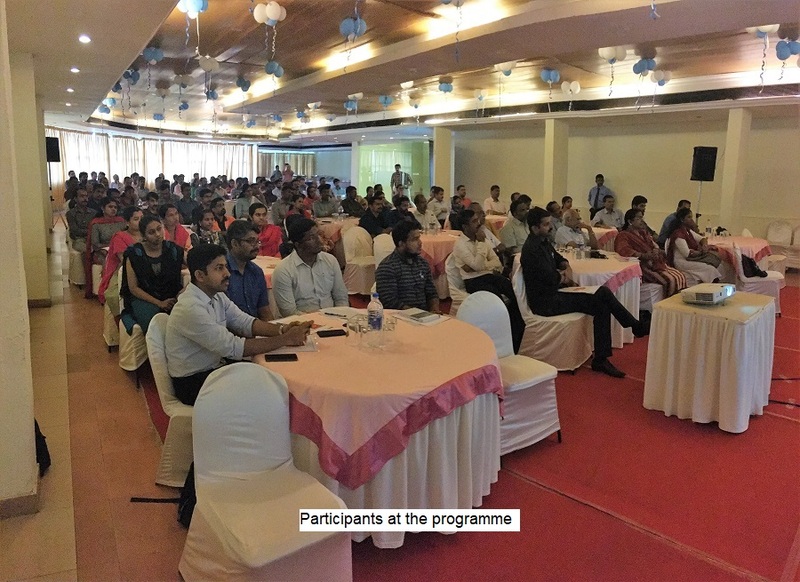 2-day Workshop on "Eligibility to Employability"
It is a normal weekday in Kochi but the schools and colleges in the city remain closed. And so are the shops, malls, and many business establishments. Vehicles stay off the roads except for a bicycle or two. There is hardly anyone visible on the roads and an otherwise busy and noisy street wears a deserted look. As another day dawns on Kerala, the people in the State are gearing up for yet another harthal. With political, economic and social reasons including fuel price rise and recently the Sabarimala row, the number of excuses to observe a harthal in the State has only gone up over the last few years. Thus the word “harthal” has unfailingly made inroads into the dictionary of an average malayalee. It is reported that Kerala observed a total of 363 harthals from 2005 to 2012 which bears testimony to the above statement. While the State is slowly trying to recover from the devastation of the recent floods, the State is now faced with the menace of the frequent hartals called for by various political parties. This year alone, to date, there have been 97 hartals in Kerala. According to estimates, Kerala incurred losses to the tune of Rs 1500 crore due to non-functioning of trade and industrial sectors in the year 2016. In the State’s Rs. 8 lakh crore Gross Domestic Product (GDP), tourism and agriculture, mostly rice, pepper, cardamom, cashew, tea, coffee, coconut, contribute about 10 percent each. The internal and external trade to contributes its mite. External trade not only comprises of exports of cash crops and other industrial goods and services from Kerala but also commercial activities from ports like Kochi and three international ports from the State. These key economic activities are the ones that are most affected by the hartals. 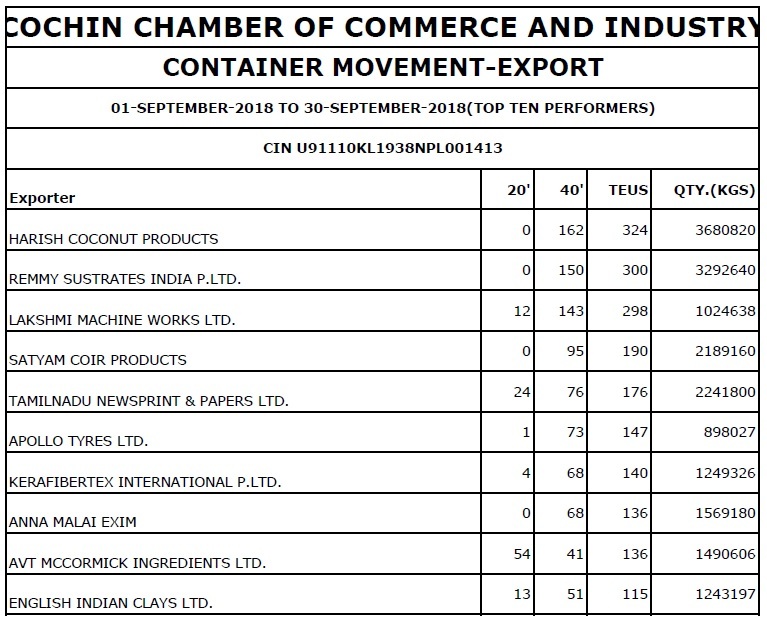 The Cochin Special Economic Zone(SEZ), Lulu Mall, Infopark, Cochin International Airport(CIAL), Cochin Port and the International Container Transshipment Terminal at Vallarpadam are among the trade and industrial sectors in Kochi that often end up as victims of this form of protest. The Cochin SEZ which employs 25000 people and the Infopark located in Kakkanad witness low employee turnout during these harthal days. 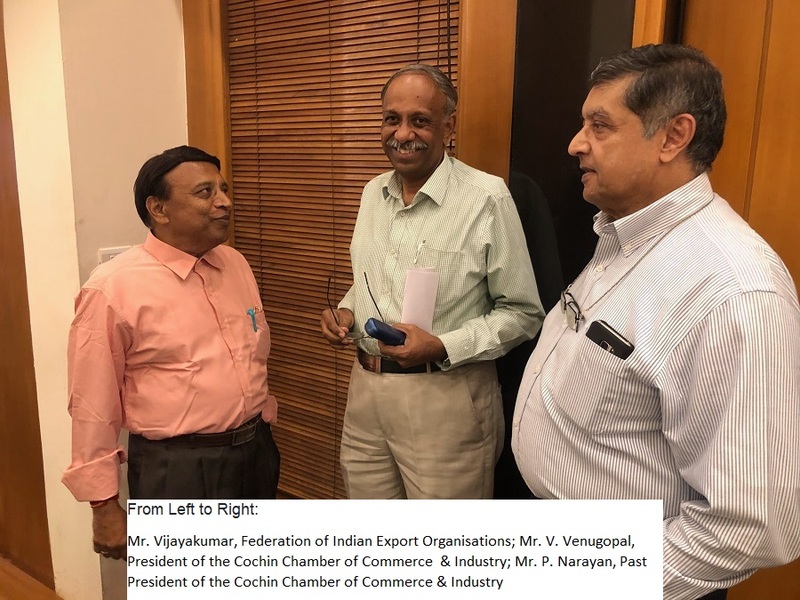 The Cochin Chamber of Commerce and Industry had entrusted the Kerala State Productivity Council (KSPC) with the work of carrying out a study on ‘How Strikes and Hartals have tarnished the Image of Kerala’ as far as International Shipping is concerned with special emphasis on its impact on the EXIM Trade- the ICTT and Cochin Port in the year 2014. 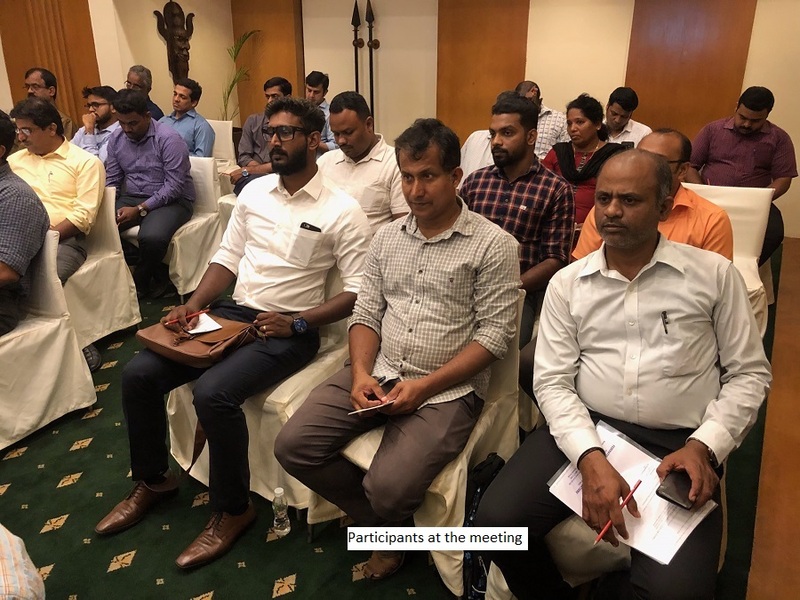 The KSPC was requested to analyze and present the facts based on operational statistics and other data and make suggestions to improve the productivity of ICTT. 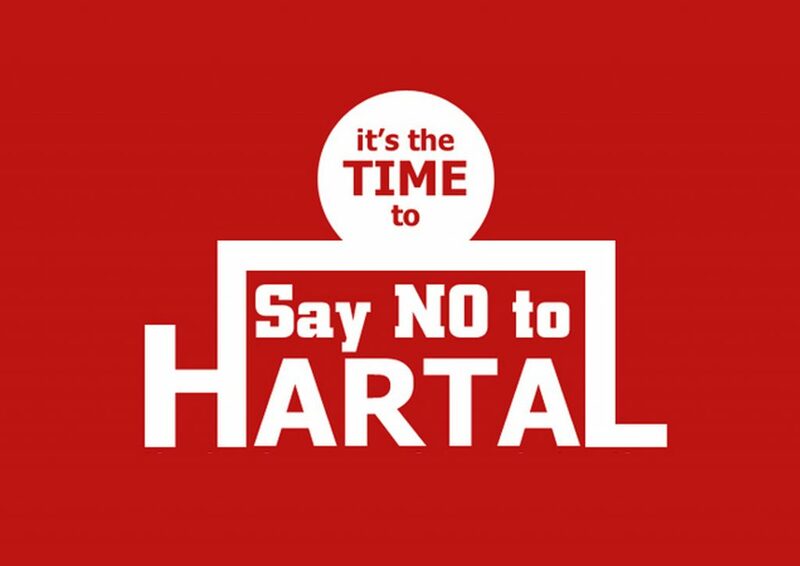 The Chamber has actively supported the “Say No to Harthals” group of volunteers campaigning against the unconstitutional and unlawful Harthals. The group has been instrumental in helping the general public during harthal days in many ways like ferrying passengers to their destinations etc. 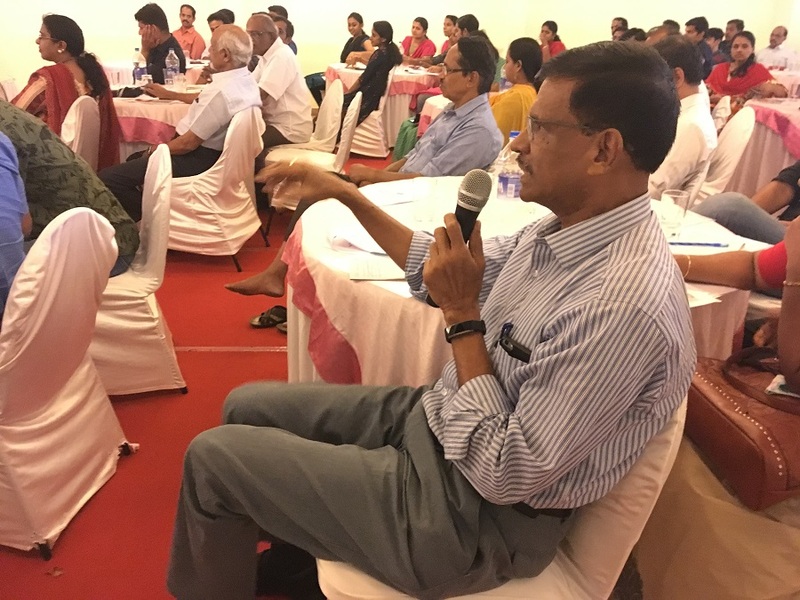 The ROHA(Regulation of Harthal Act) was presented to the public on 30.10.2015 to regulate harthals and it was constituted by a panel comprising the group and was headed by Justice PK Shamsuddeen. During the previous Government’s tenure, the Hartal Regulation Bill was introduced in December 2015. The Bill was sent to a Select Committee for consideration but has not seen the light of day since then. 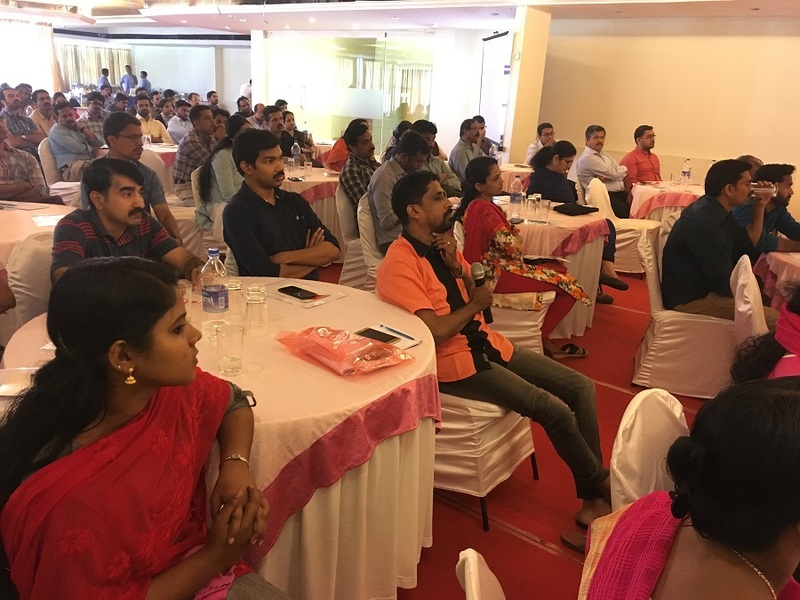 Though normal life is disrupted during a harthal, activities of various volunteer organizations, NGOs and other groups have provided some relief in the last few years.Thankfully, the era of sitting back and enjoying a hartal holiday seems to be a thing of the past. Various groups like the VyapariVyavasayiEkopanaSamithi (VVES), have decided not to participate in hartals called by any political party unless it is for the development of the State. Recently the IFFK (International Film Festival Of Kerala)heldat Trivandrum saw such an effort by ‘Food For Freedom’,an initiative of the CentralPrison while they offered food at reasonable rates for the movie buffs who had come to attend the event on a harthal day. In May 2018, Kerala had decided to shield its Rs. 29000 crore tourism industry from harthals so that they don’t hit the revenue of the Government and thus the State’s thriving tourism industry. 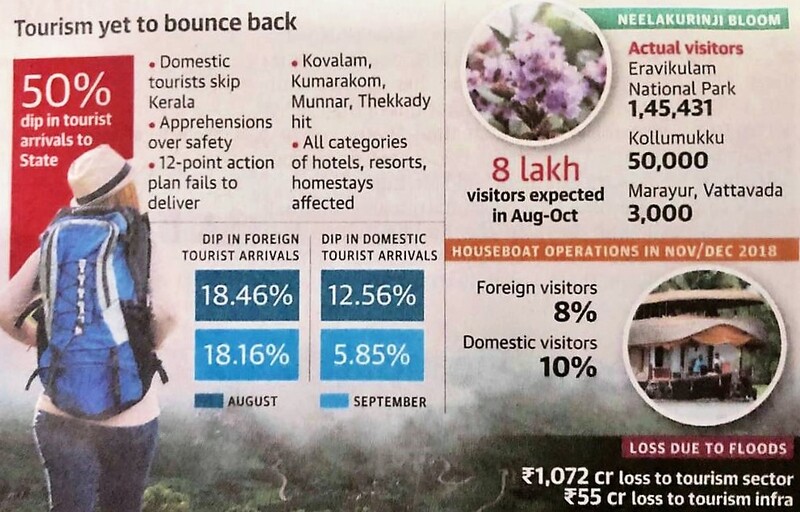 The tourism sector which generated a revenue of 234 billion dollars in the last financial year has heavy potential for further development besides providing employment to a large number of people.The tourism sector, the mainstay of Kerala economy, is bleeding from the impact of these unmindful hartals.Each hartal burns a Rs 200-crore hole in the economy of the State with the tourism sector coming to a grinding halt.Recently around 50,000 domestic and foreign tourists were trapped indoors due to the recent state-wide shutdown. 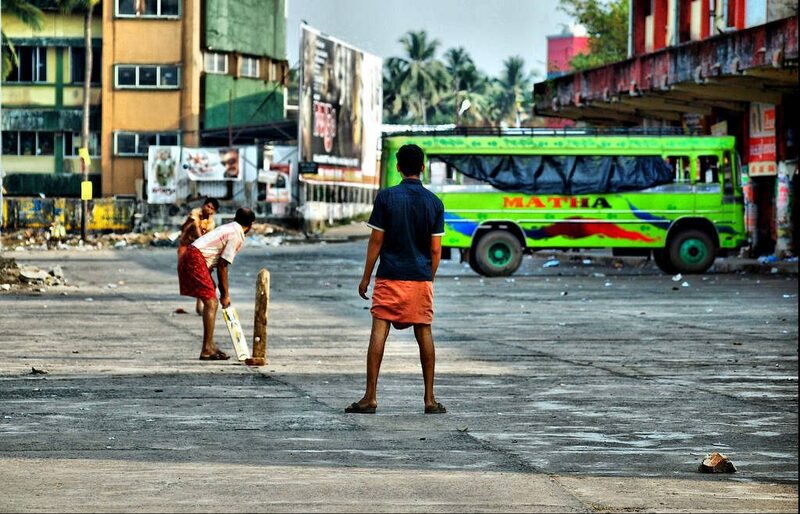 Around 2,500 foreign tourists, mostly from the UK and Germany who arrived in Cochin by a chartered flight and four cruise ships were left in the lurch when Kochi shut down in the wake of the hartal. Frequent hartals have affected the tourism industry badly and the negative impression created by these unwarranted strikes wherein vehicles are blocked and tourists threatened has resulted in numerous cancellations. According to a report by the Labour Ministry, tabled in Parliament, Kerala has lost around 2.1 lakh, 2.11 lakh, 2.94 lakh, and 1.53 lakh (January-October 2017) man-days on account of the lock-out in the state’s industrial sector in 2014, 2015, 2016 and 2017, respectively, while it was 1.71 lakh, 4.04 lakh, 1.65 lakh and 1.37 lakh days during the same period due to general strikes. The state’s industrial sector incurred a loss of `15.15 crore due to the total man-days lost during the 2017 (January-October) period. The office of the LabourCommissionerate, Thiruvanthapuram, has revealed as per their estimate the state had lost 4.24 lakh and 3.23 lakh man-days due to layoffs in 2016 and 2017. The annual report compiled by the authorities confirmed the state also lost 1.60 lakh and 95,000 man-days due to strikes in 2015-16 and the 2016-17 period, excluding the strikes like hartals. 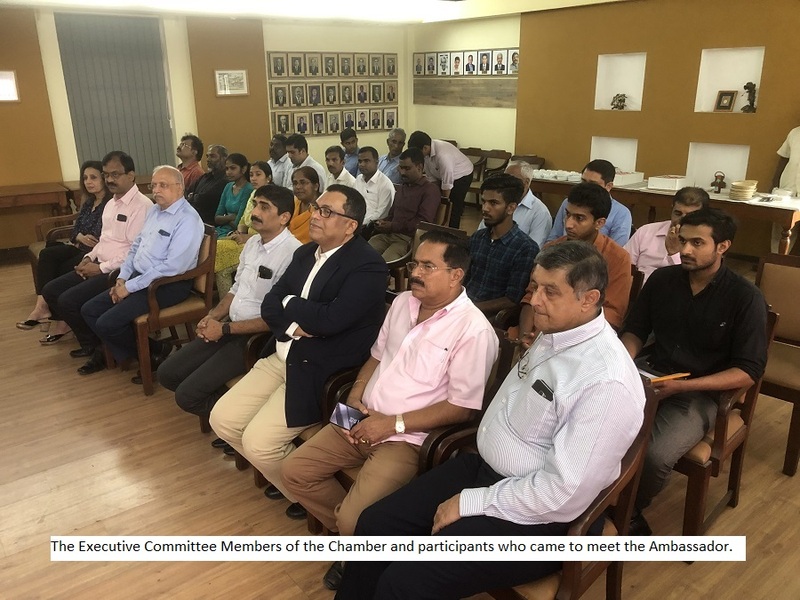 Perhaps Kerala should take a cue from its neighbor Tamil Nadu in this regard as they follow alternative modes of protests without causing hindrance to trade and commerce.The Chamber has always voiced its opinion against harthals and will support any initiative to promote this cause. Ideally every Keralite should start reflecting on these lines in order to prevent our State, known as “God’s Own Country” from being transformed into a “Harthals’Own Country”.